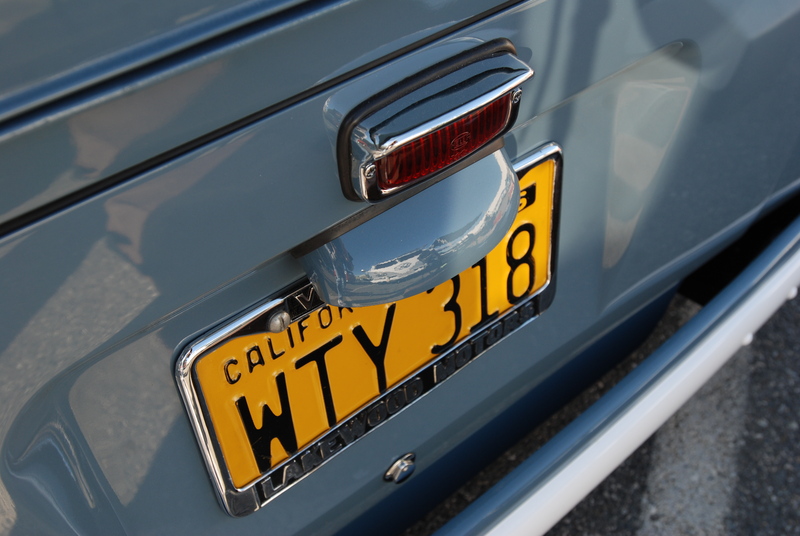 Like swallows returning to the Mission in San Juan Capistrano, Saturday, February 23 witnessed the return of the O.C.T.O. 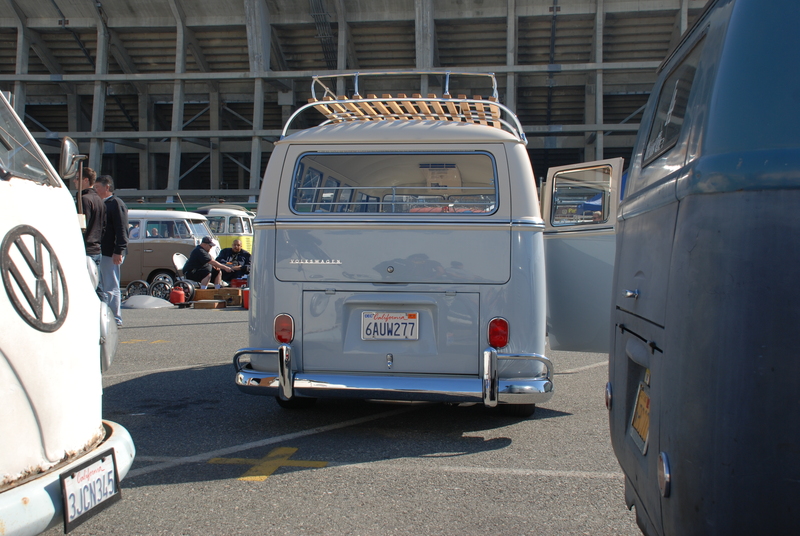 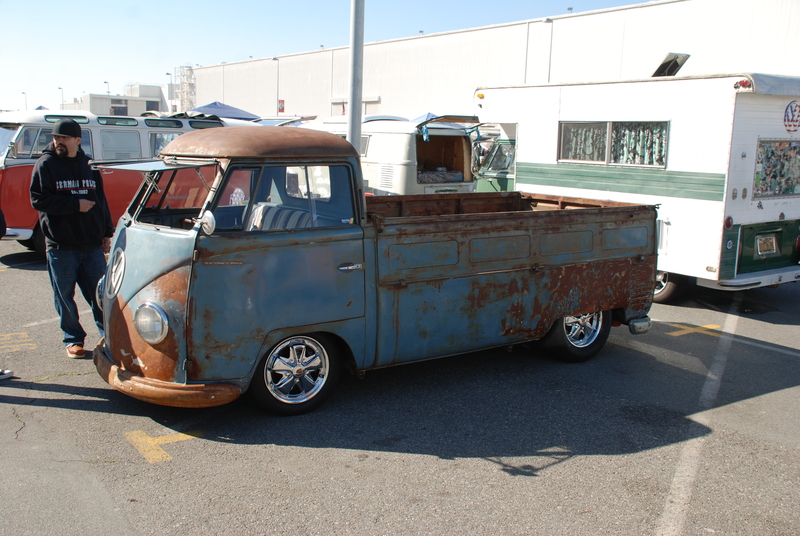 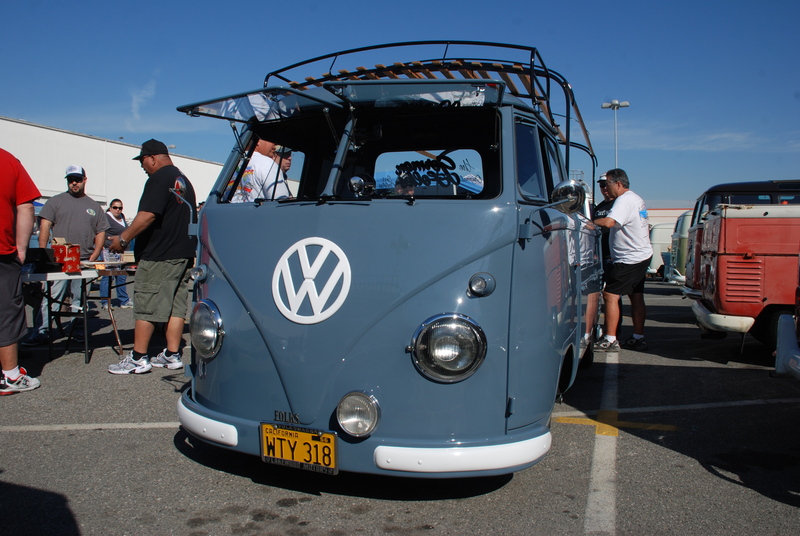 (Orange County Transporters Organization) Winter Meet, Swap and Display to Veteran’s Stadium in Long Beach California. 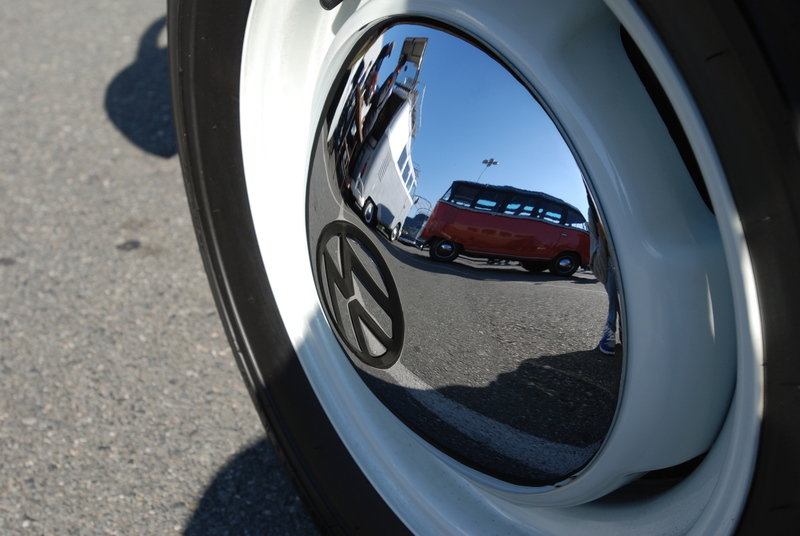 This year marks my second time attending this event, and I’m sure there were a lot of other people who like myself, came with aspirations of VW Type 2 ownership. 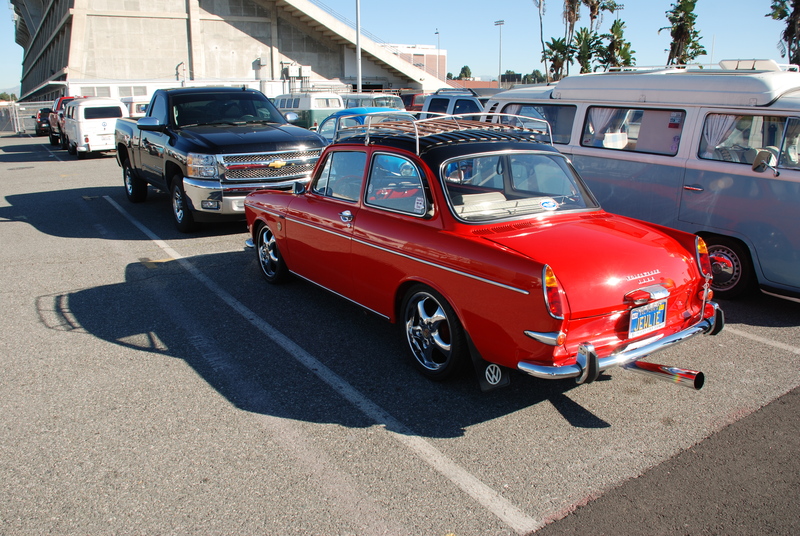 And just like last years event, there was a parking lot filled with the prospect of amazing vehicles to suit just about any taste. 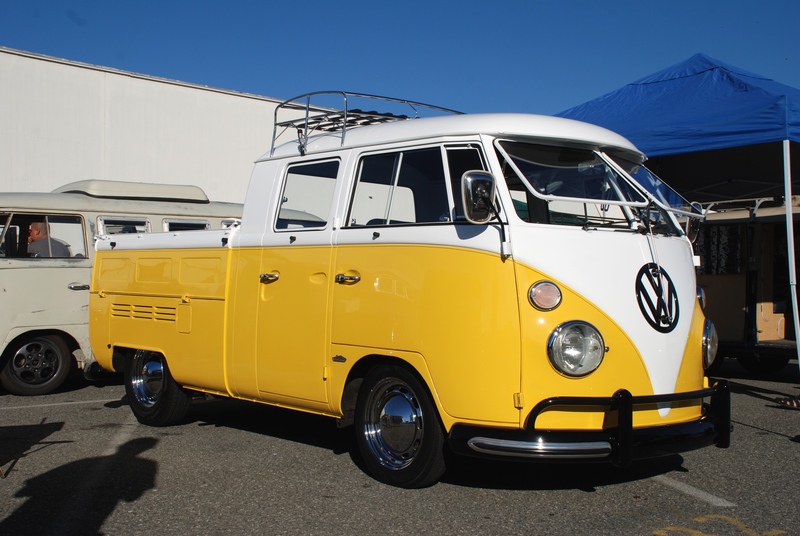 And there’s nothing quite like the sense of anticipation, as one approaches a parking lot filled with nothing but Type 2 Transporters as far as the eye can see..
and its equally impressive engine compartment and detailed motor. 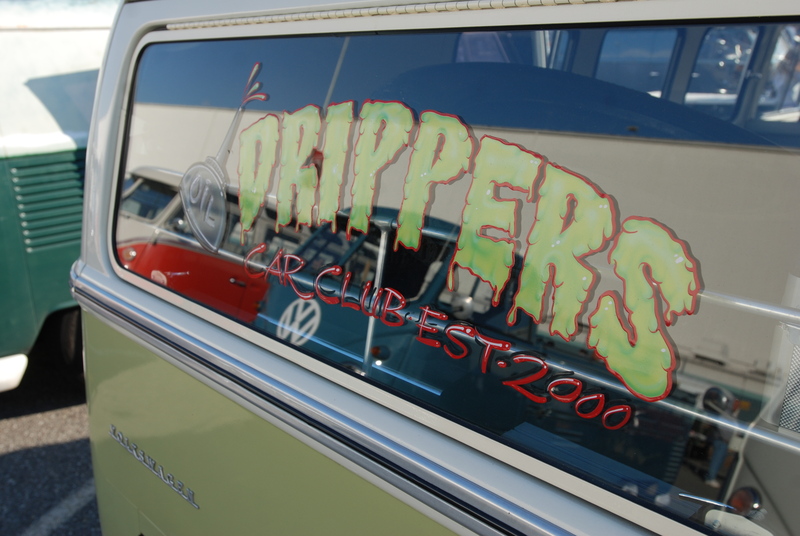 Another two toned, safari windowed bus, representing the “Oil Drippers” car club. 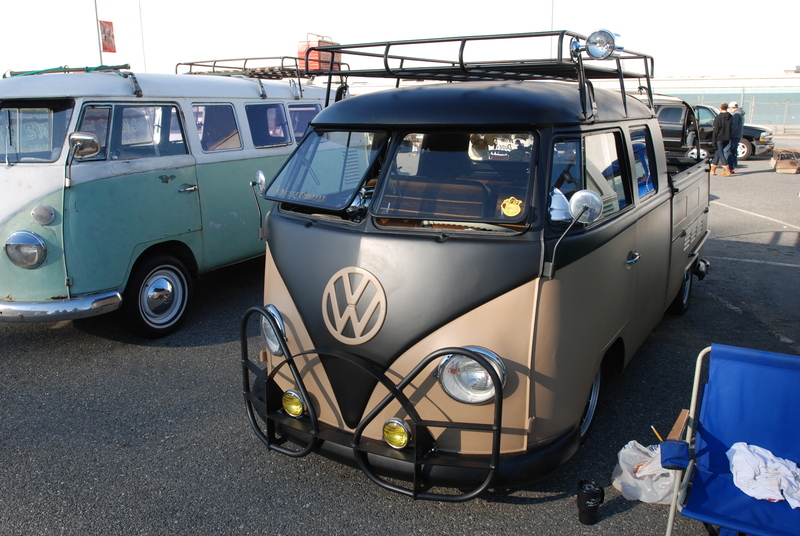 Another of the current automotive trends is matte finish paint. 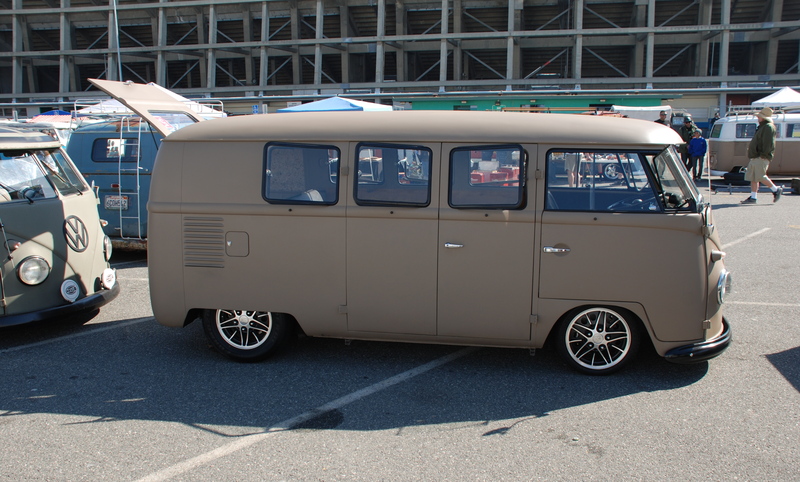 Below are some of the Type 2’s in attendance wearing matte paint finishes, in both monochrome and two-toned schemes. 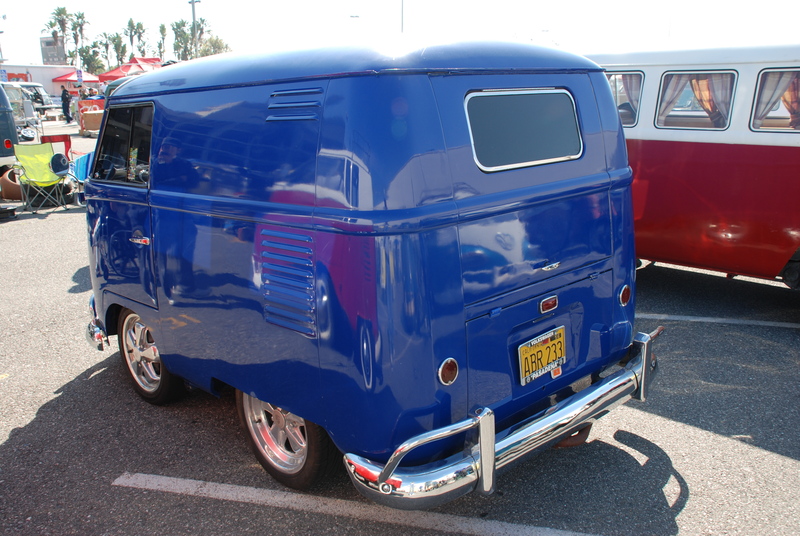 complete with safari front windows and side pop-outs (above & below). 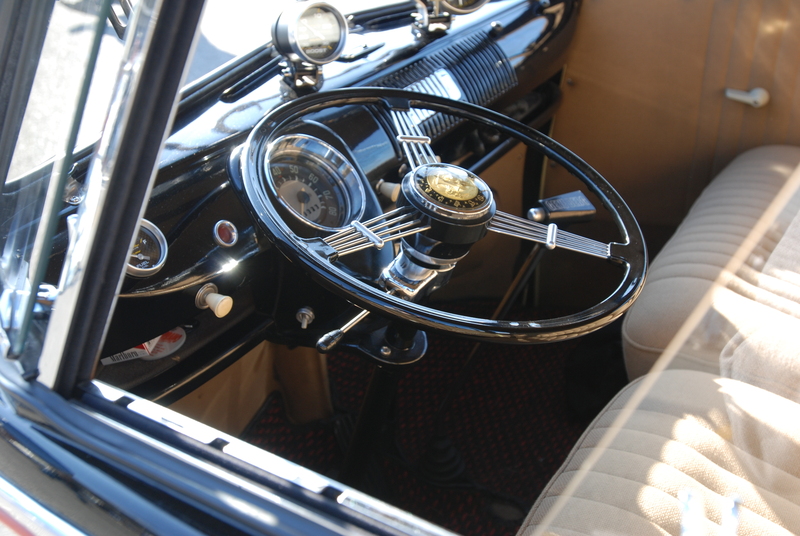 Classic banjo styled steering wheel and custom upholstered interior. 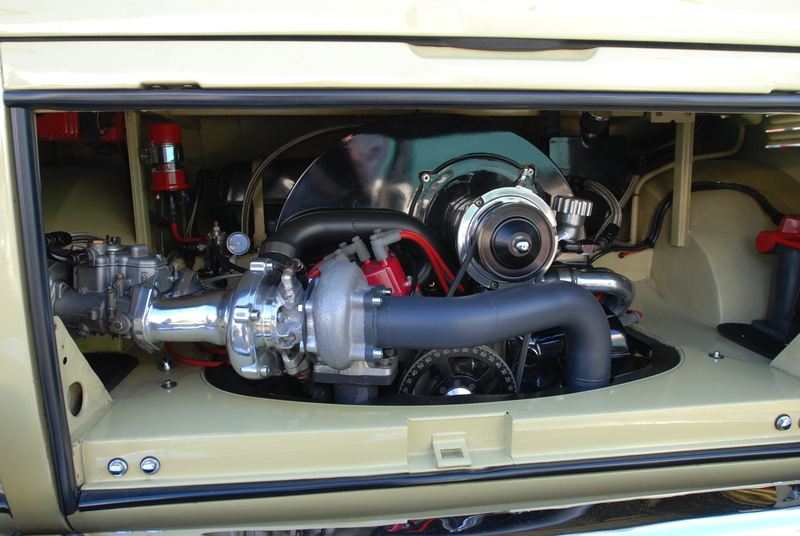 And out back, an unexpected surprise: a custom turbocharged motor. 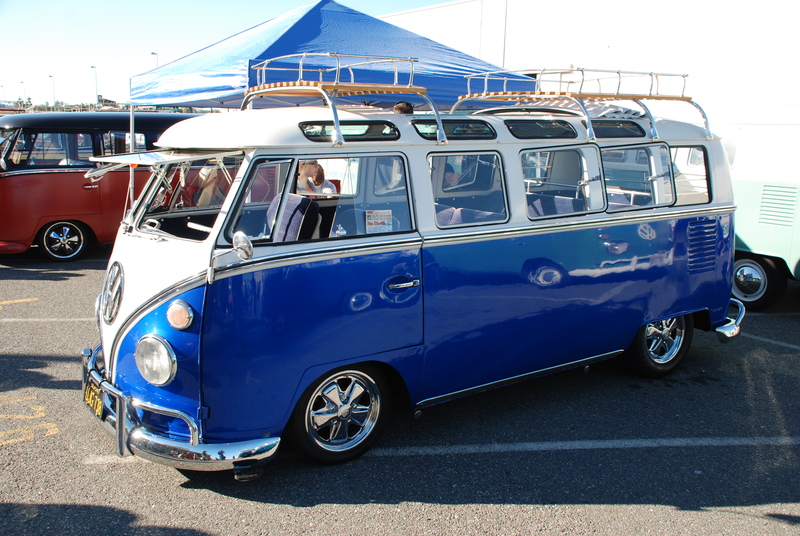 In stark contrast, and located several rows over, was this Dove Blue single cab with its OG finish, yet sporting a set of polished, Porsche Fuchs 5 spoke alloy wheels. 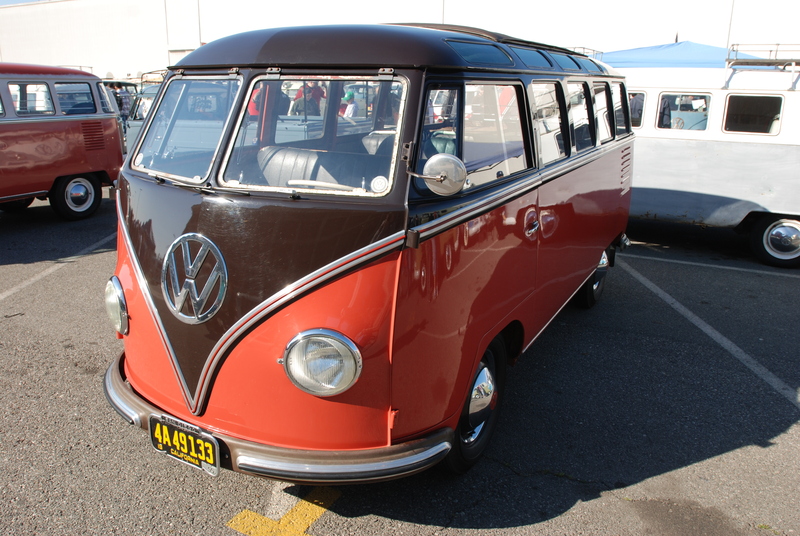 And no Type 2 show would be complete without at least one pre 1955 bus, in the classic two-toned color combination of Chestnut Brown over Sealing Wax Red. 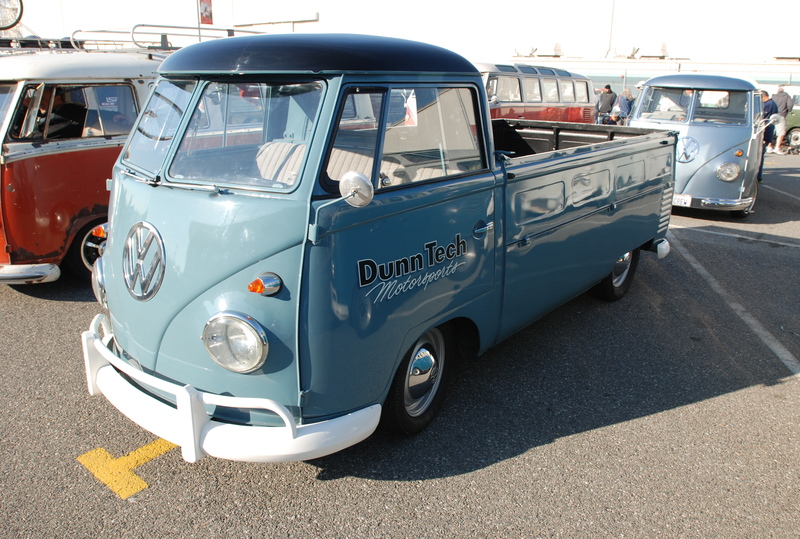 One of my personal favorites from the show was this amazing, 1958 Dove Blue single cab (as seen below). 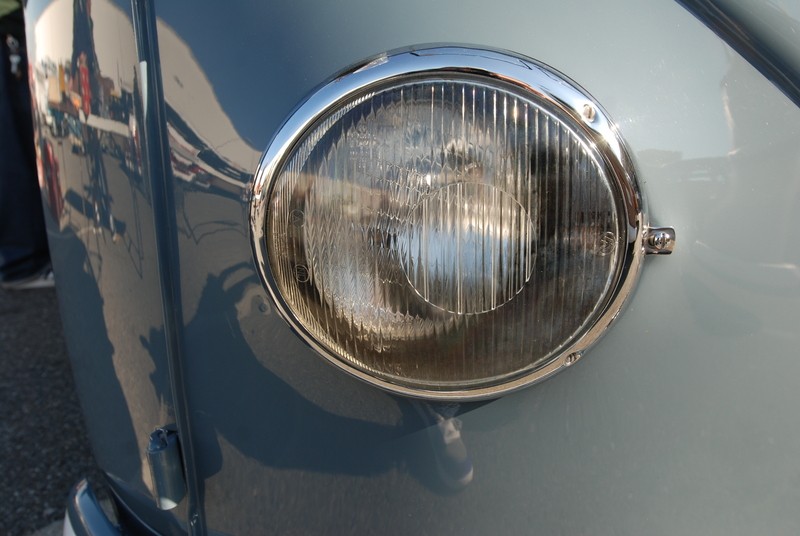 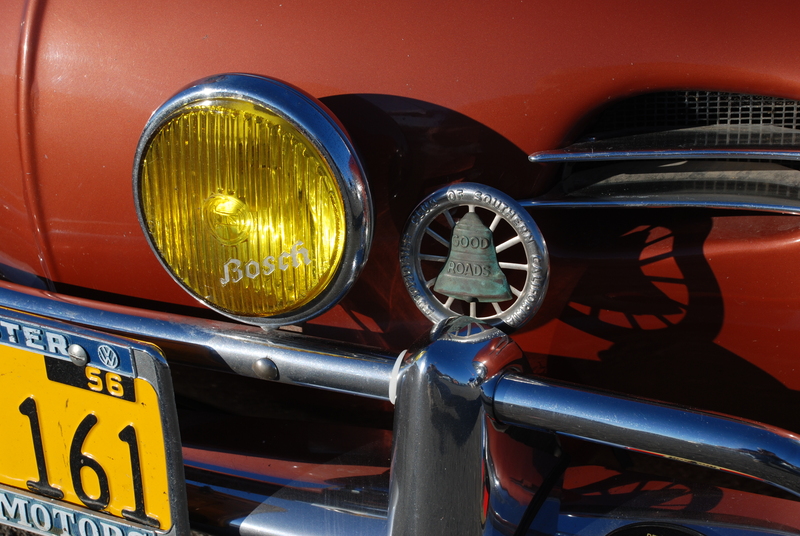 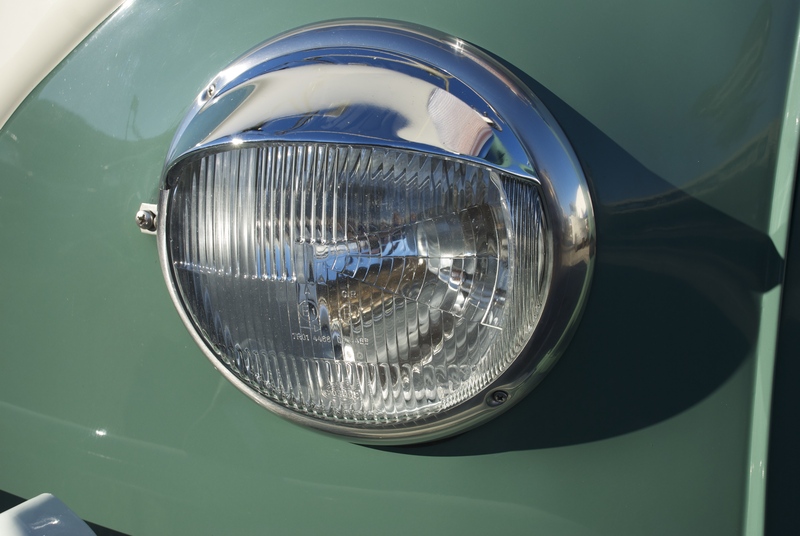 Another example of the very cool European fluted headlight lens. 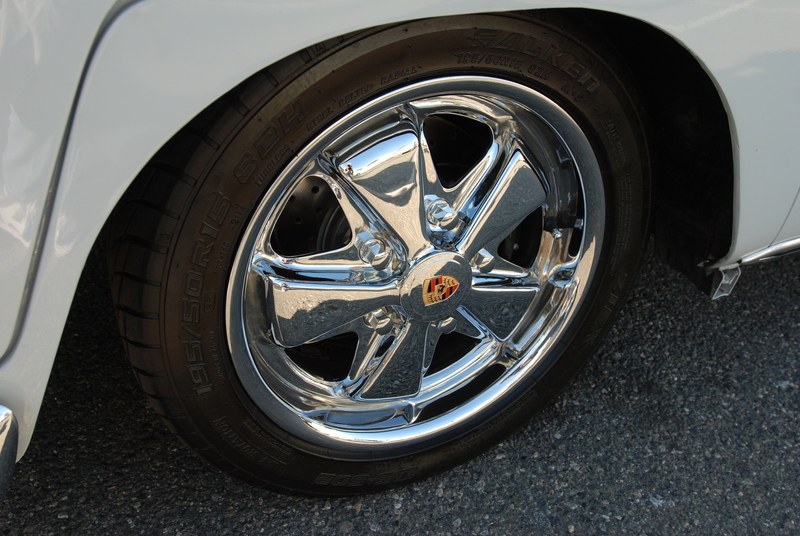 And once again, another Type 2 wearing a set of polished Porsche Fuchs 5 spoke alloy wheels, but in this case running a wider wheel set up front, instead of the traditional (narrower) 4-1/2″ X 15″, 5 spoke wheels. 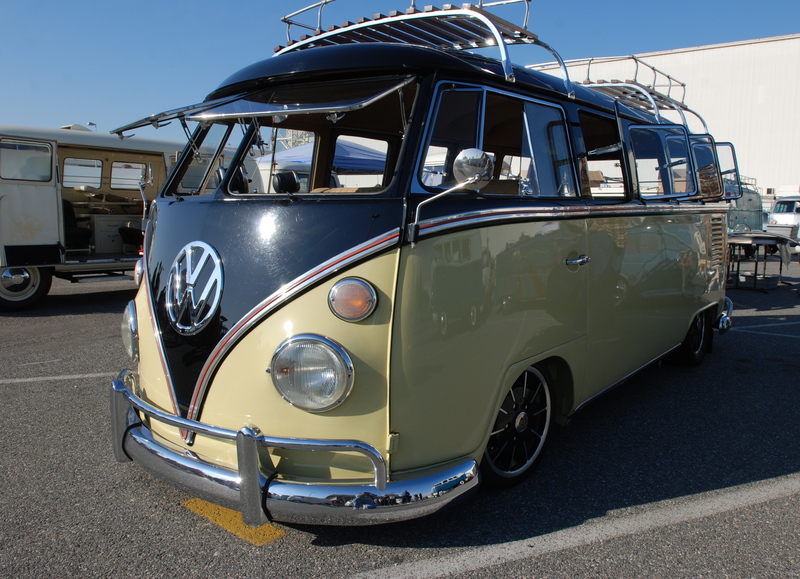 Another of the beautifully restored, mid 1960’s vintage, two-toned buses, fitted with dual wooden slat roof racks and wrapped in a flawless, mirror like paint finish, perfect for reflecting its surroundings. 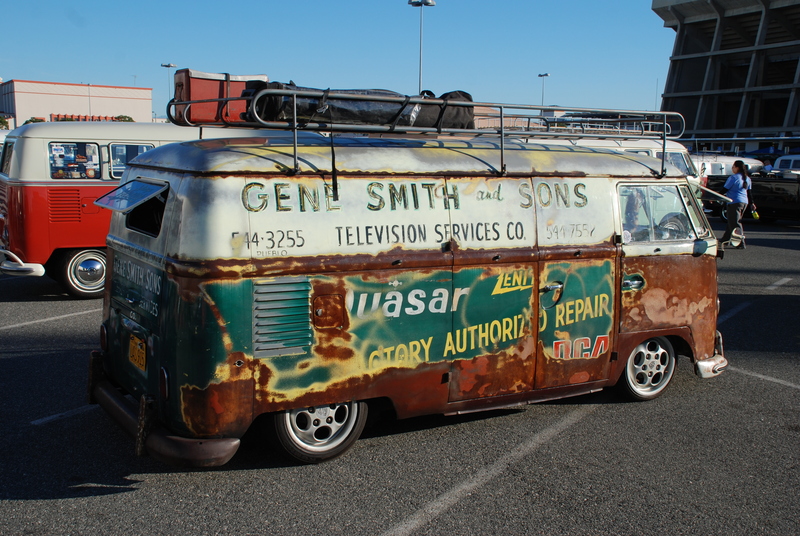 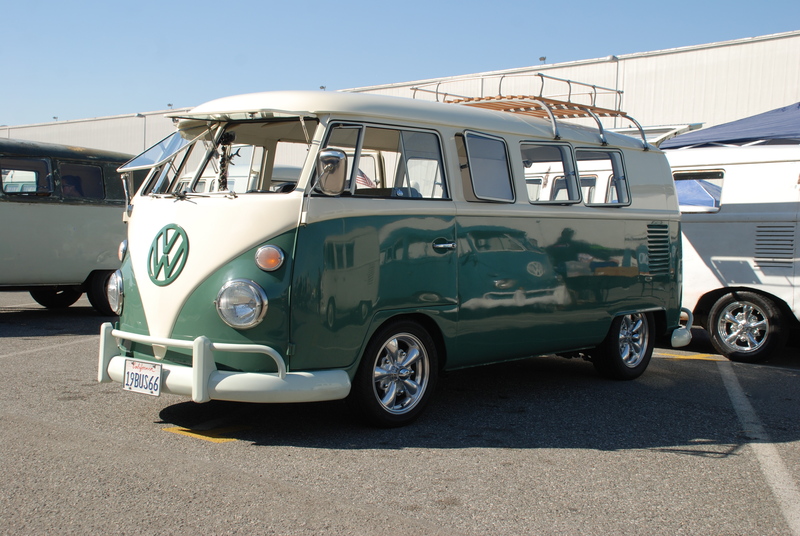 As the license plates notes (see below), this is another 1966 vintage, two toned bus (Velvet Green over Pearl White), fit with a pair of fully functioning Safari front windows and side pop outs. 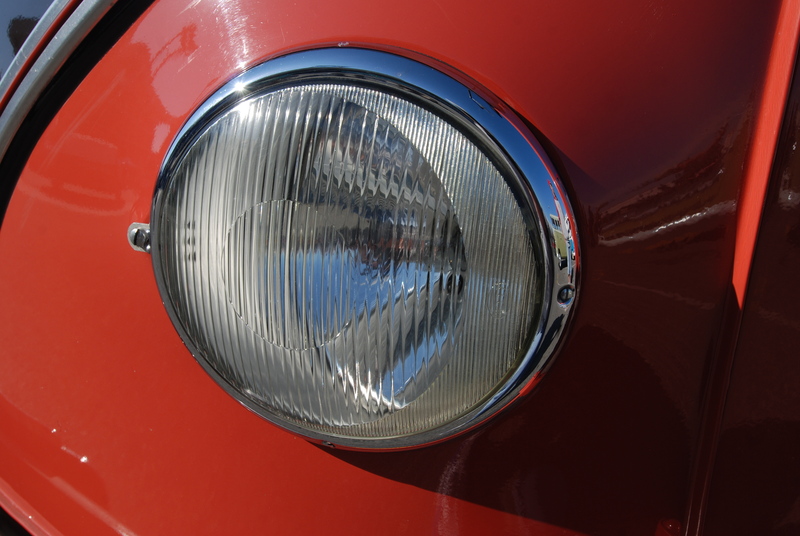 Equally impressive is knowing the amount of time needed to produce these type of visual results and flawless paint finishes as displayed. 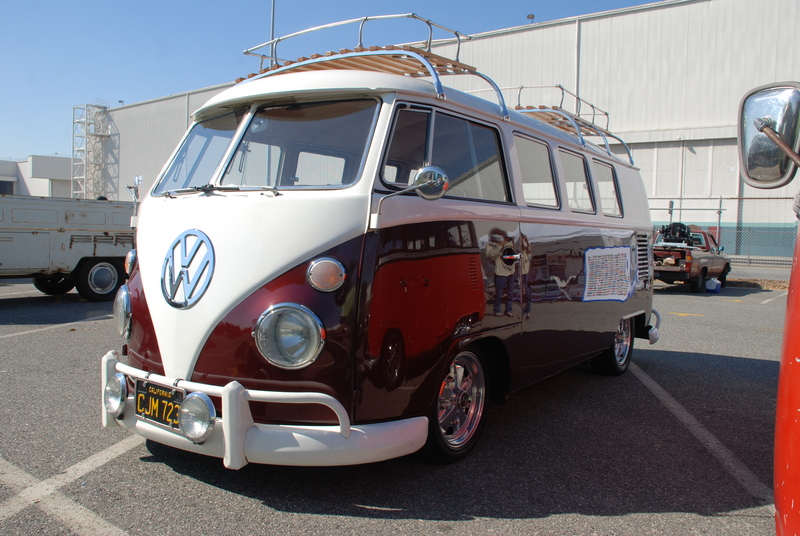 The second of my favorite buses from the show was this spectacular 1966 model (as seen below), complete with front safari windows and its unique two toned paint. 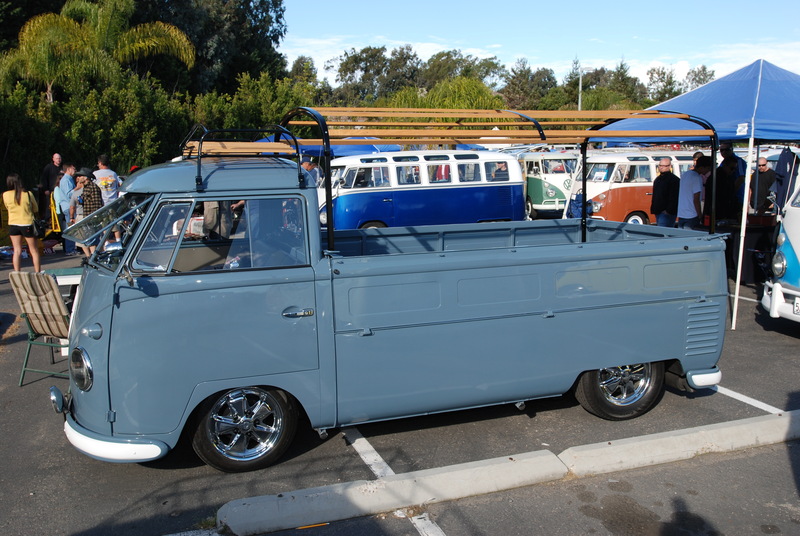 The owner when asked about the paint colors, shared with me that he had stayed brand loyal, and specified a 2004 VW color for the pale blue lower panels, and a 2009 VW color for the pale cream panels (nose, roof and dash). 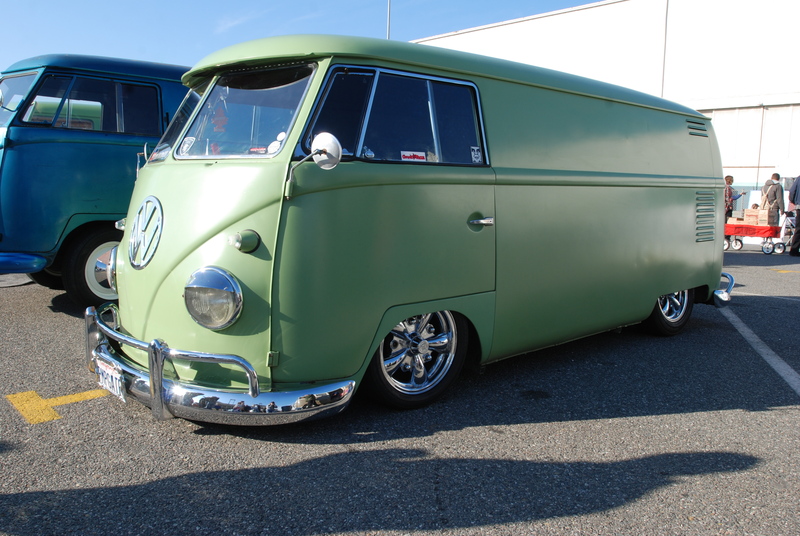 Seeing this bus, and appreciating all of the hard work and efforts put into creating such stunning results, is what provides inspiration for those of us with dreams of Type 2 Transporter ownership. 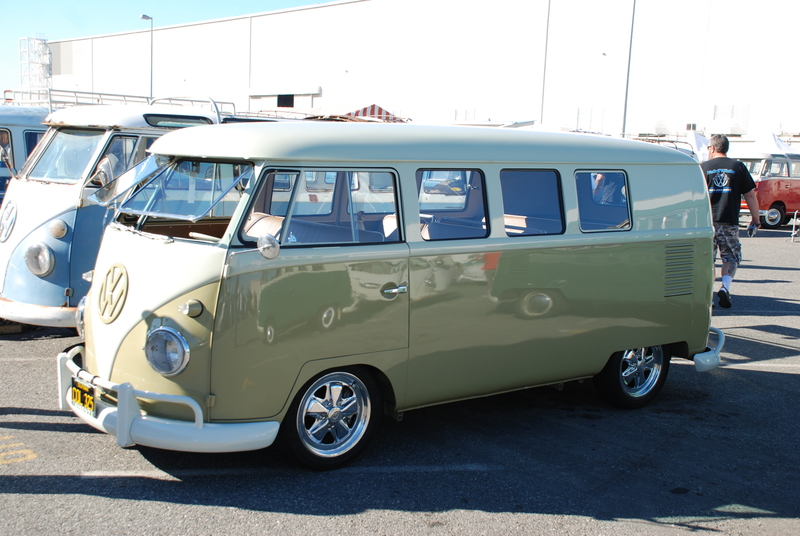 This unique color palette even carried over into the interior, with the owner using a light tan upholstery, complemented by the light cream colored piping accents found on the seating. 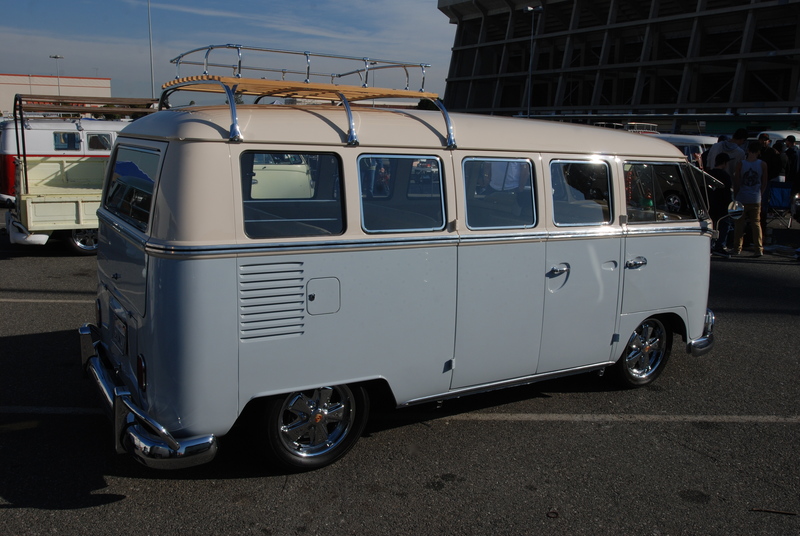 Another perfect choice of wheels as seen below; Polished Porsche 5 spoke Fuchs alloys, mounted front and rear. 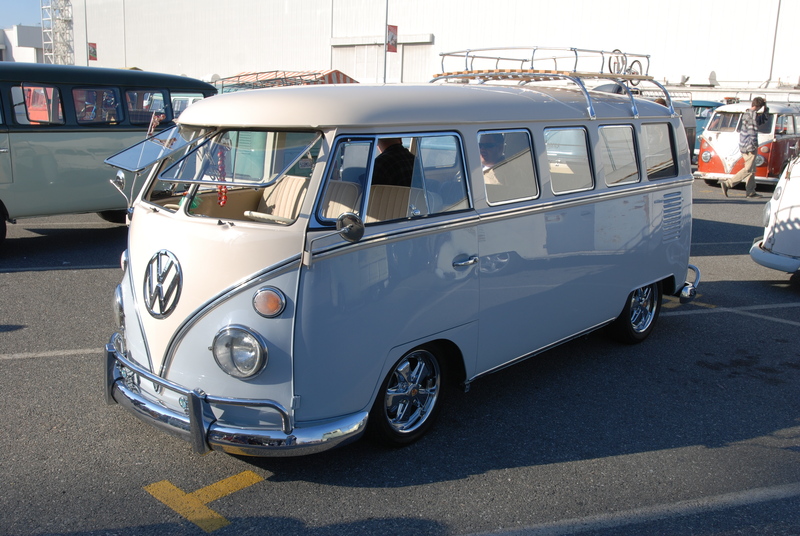 On the way back to my car, I happened to pass by this pale gray colored single cab, and in the process, caught a glimpse of a silvery object resting in the rear bed. 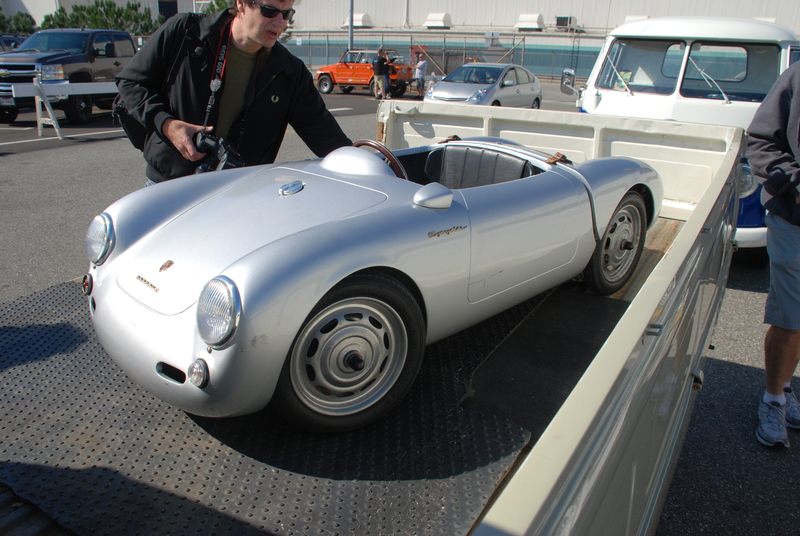 As I approached, It quickly became apparent that the silver object in the rear bed was in fact a scaled down version of a Porsche 550 Spyder. 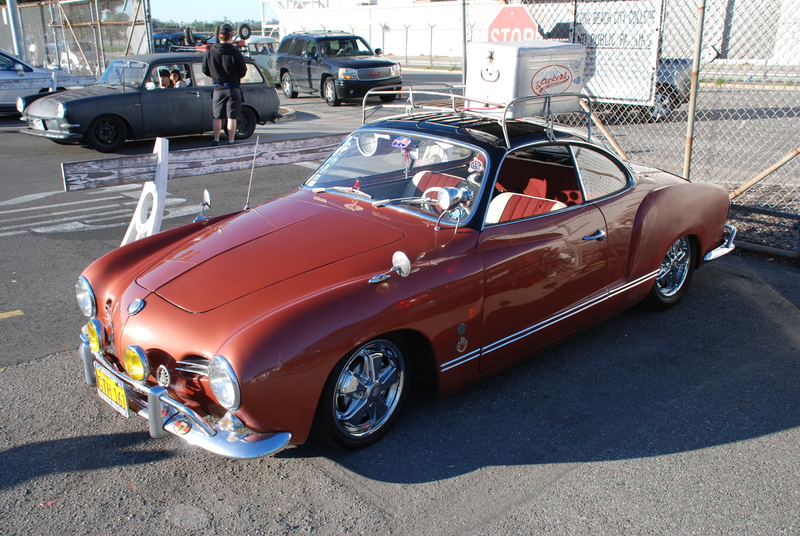 After talking with the owner, I learned that this single seat replica was in fact an electric-powered, and potentially a very cool ride for a small child. 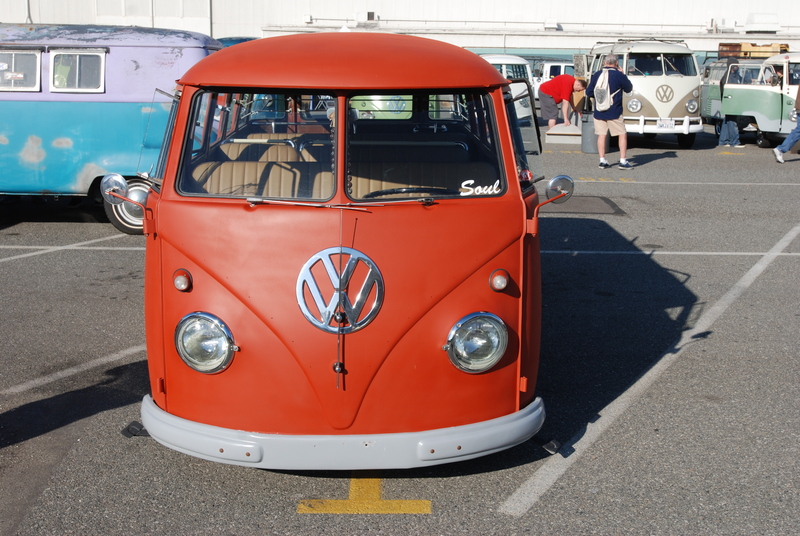 While out driving this past weekend, I happened to come across a beautifully restored example of a1961 VW, 23 window bus, out for a drive in its glowing sealing wax red / beige gray paint scheme. 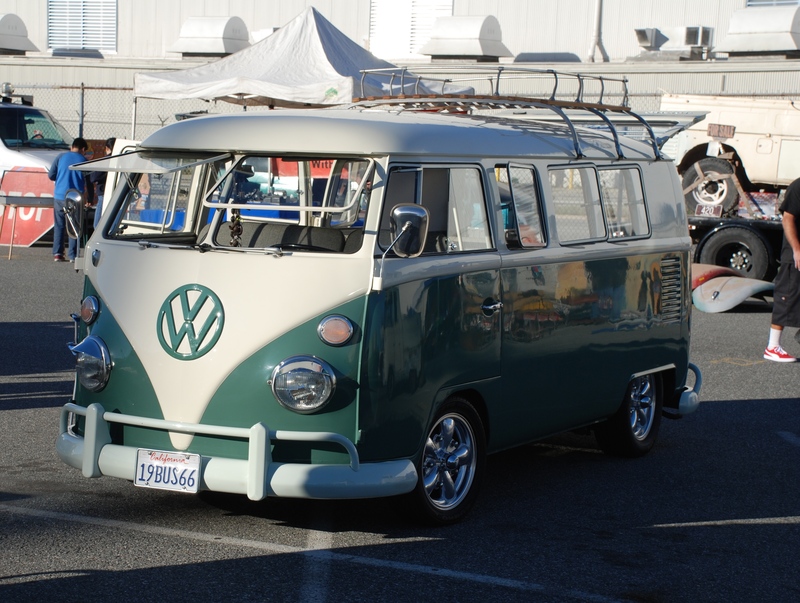 I recognized this bus from a recent car show and when I returned home, searched through my digital files and found a shot of the same bus that I had just seen earlier that afternoon. 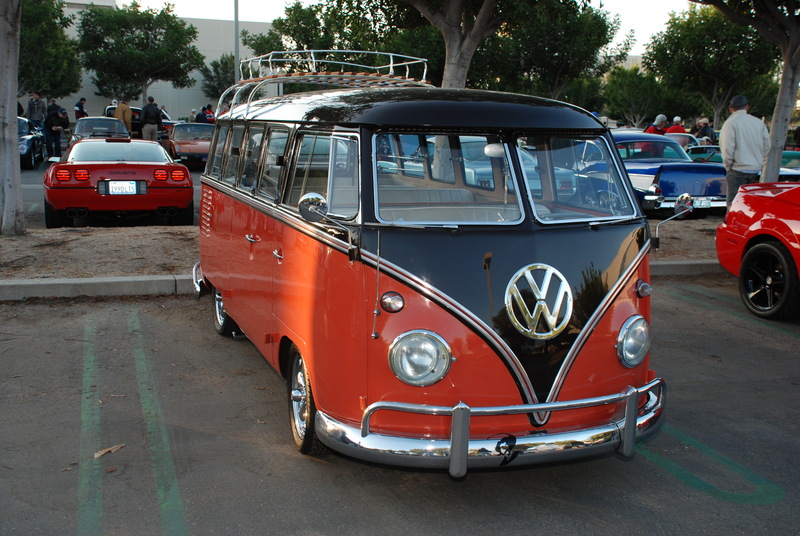 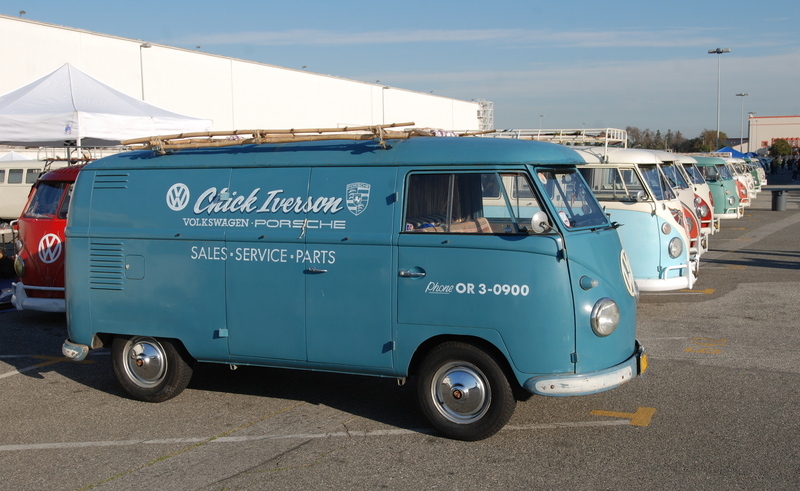 This brief encounter got me to thinking about a time back in the early 1990’s, when I had the opportunity to pick up a 1965 VW type 2 panel van from a friend I worked with for $500. 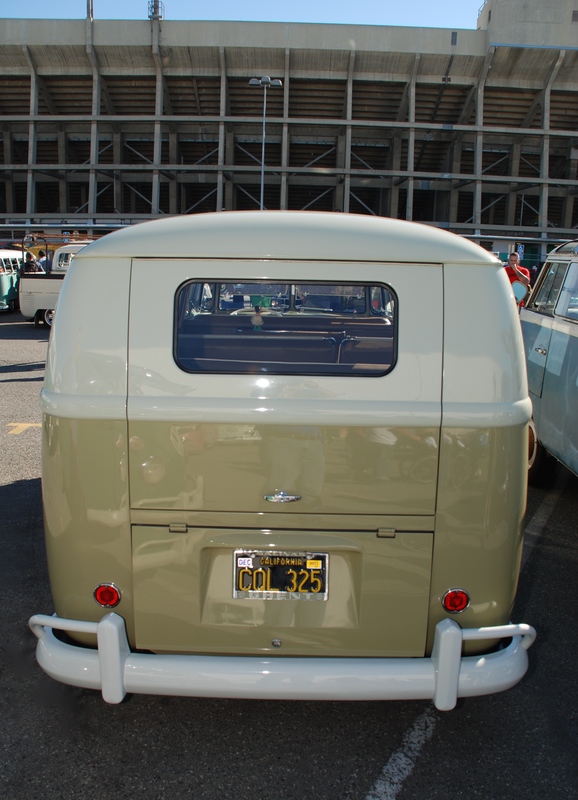 He had already begun the restoration; the body work had been completed, and the entire van was now covered in gray primer. 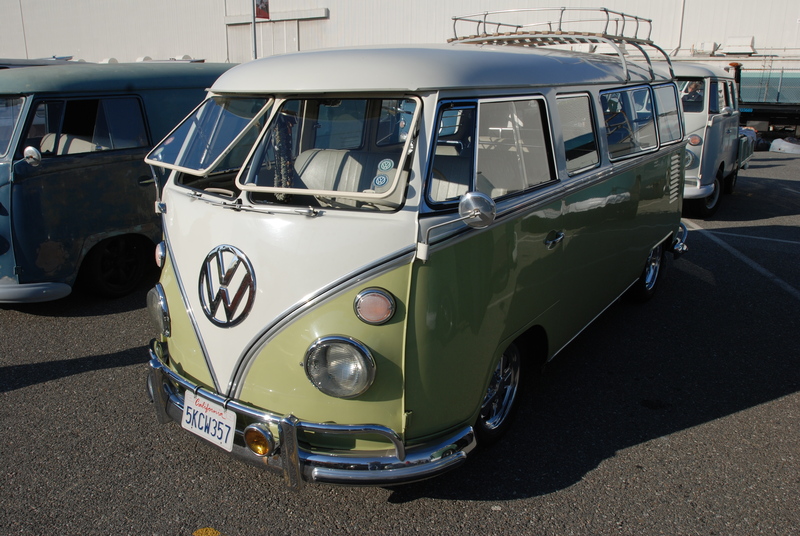 The suspension had been rebuilt and the bus had been lowered, and sat on stock wheels. 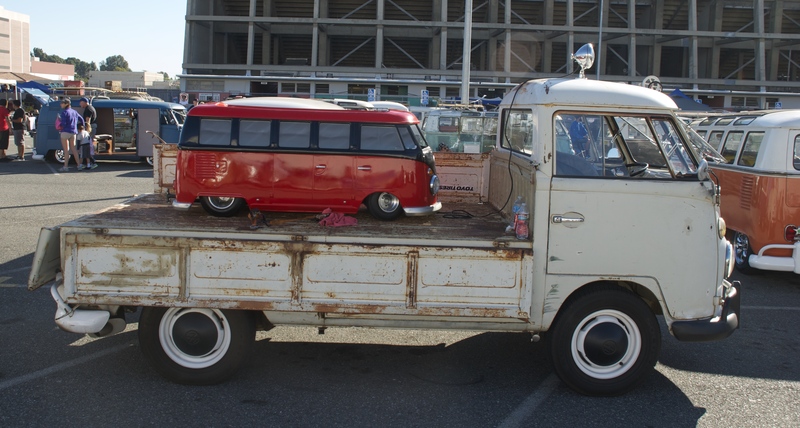 There was no motor, however I did not see that as a problem. 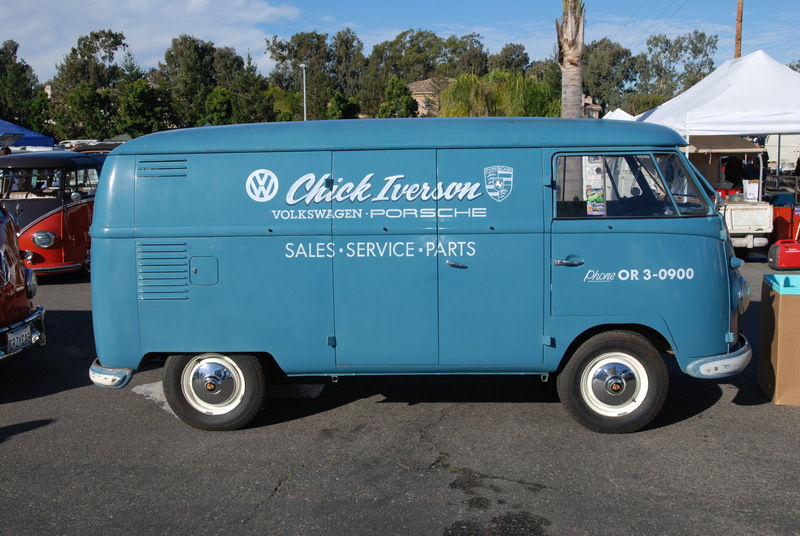 Since the van still had its original transmission, I would just need to source a new motor. 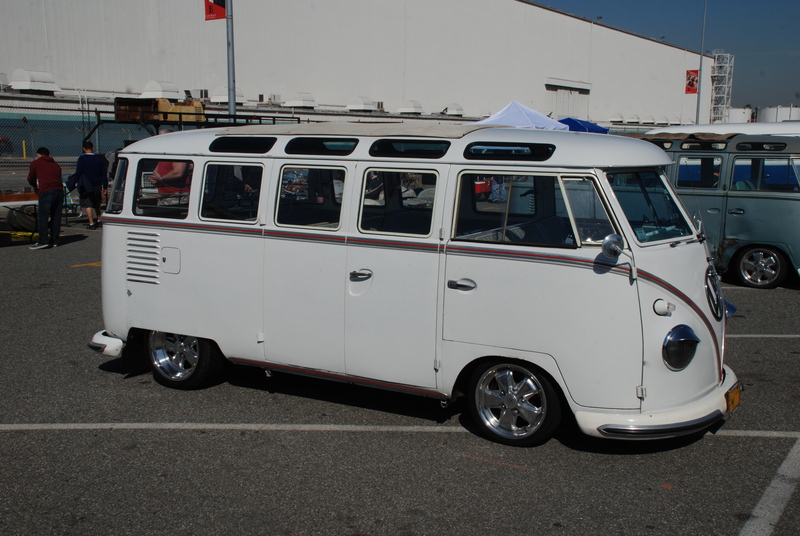 It was literally a blank canvas awaiting a new owner to complete, and make it his or her own. 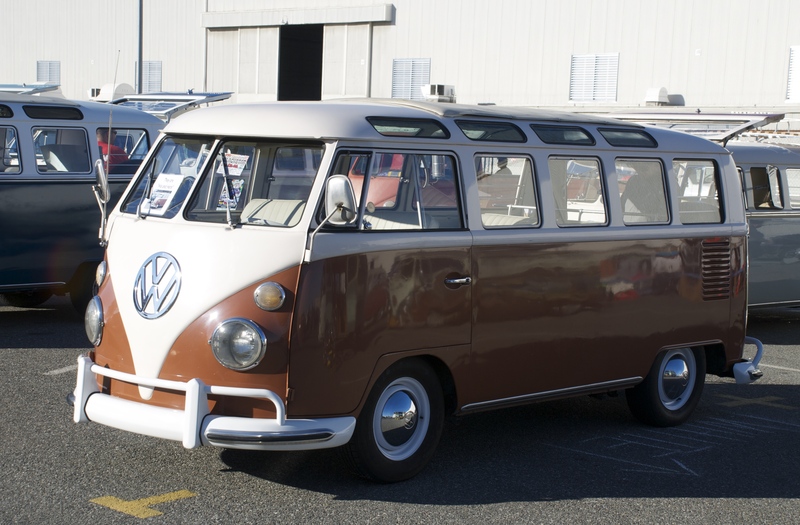 And with this being my first introduction to the world of type 2 transporters, I began imagining the possibilities, and for $500 how could I go wrong? 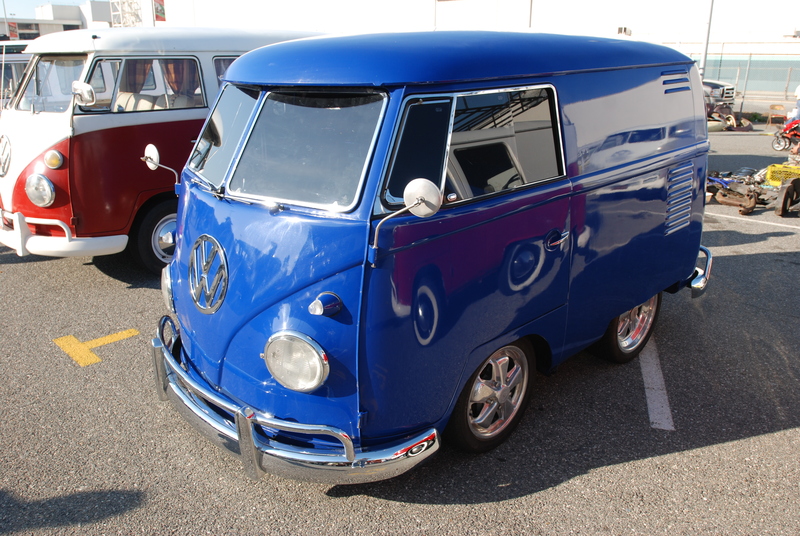 Well the years have passed, and with my sons both graduated from college, I have once again begun looking at VW type 2 transporters, and trying to educating myself regarding the differences and features specific by model year. 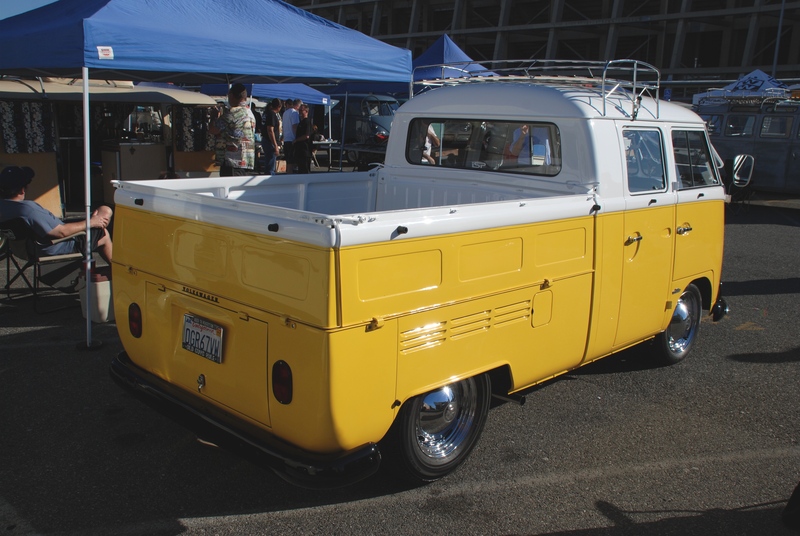 During this process I have learned about the single cabs, dual cabs and the safari windowed models, in addition to the variations found within the delivery / panel vans family. 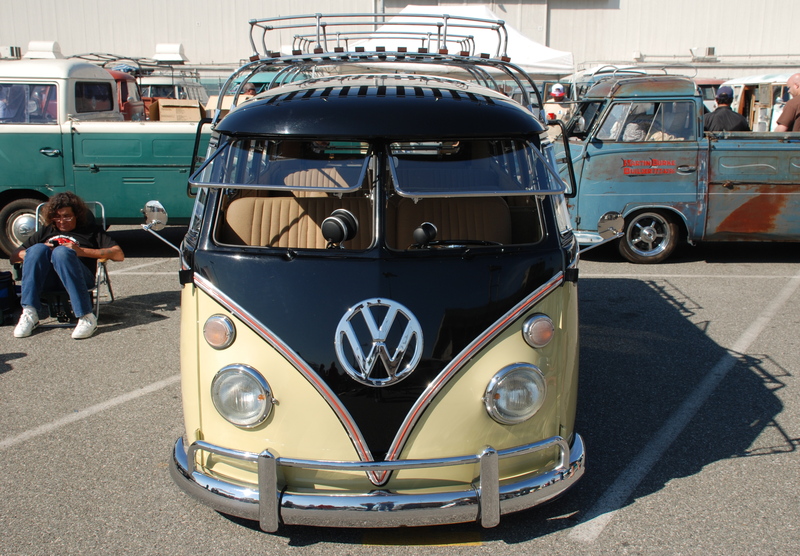 Part of my education process has included attendance at some of the local car shows, specifically the Bug-in / Treffen events held in Anaheim, California, and the O.C.T.O. 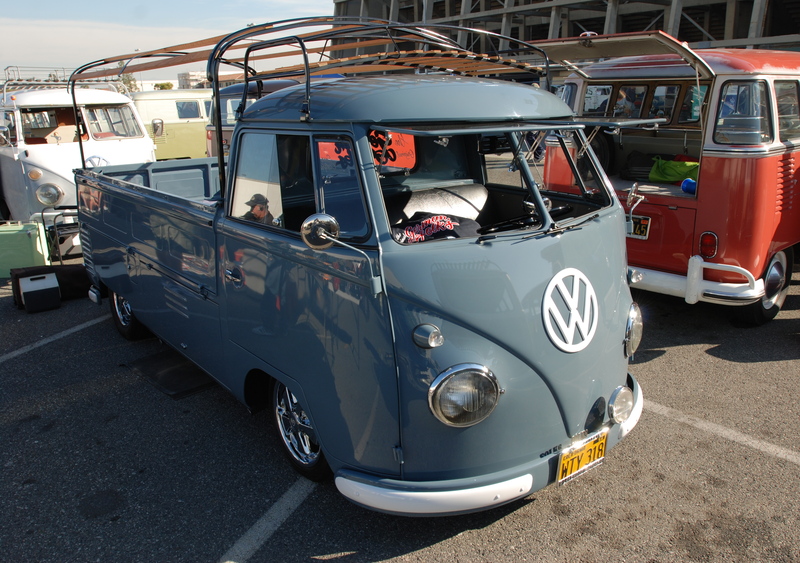 Fest events held in Huntington Beach, California. 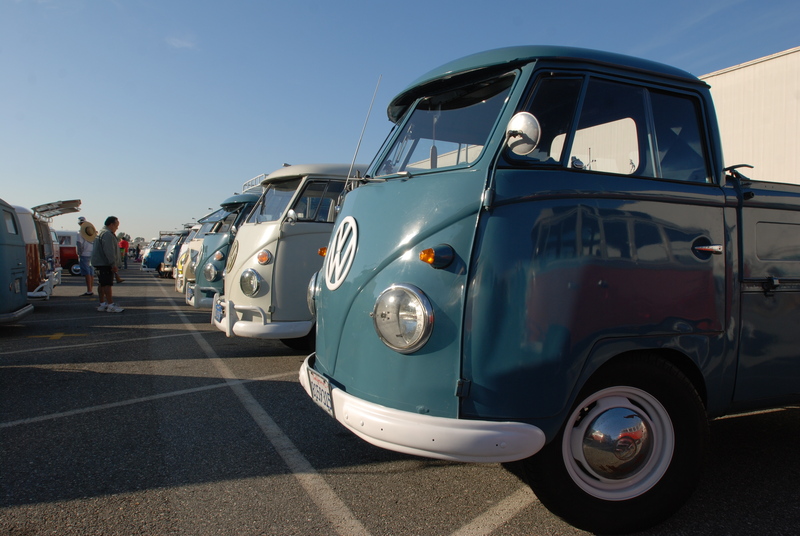 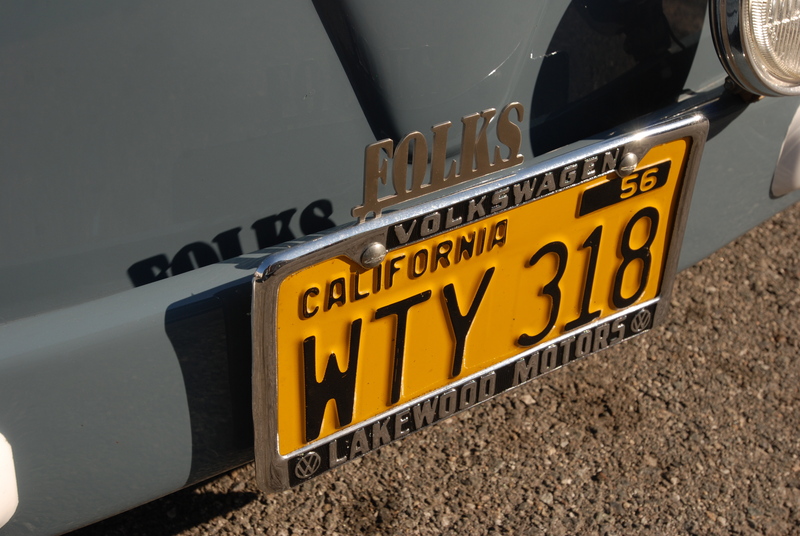 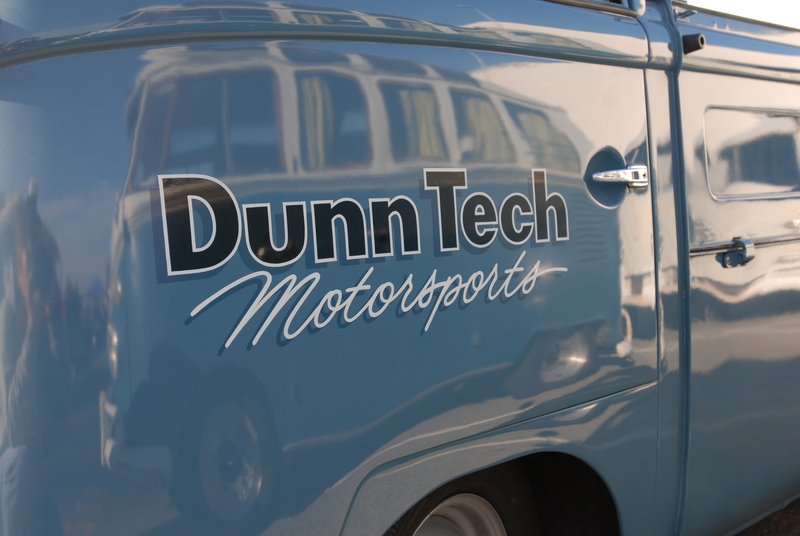 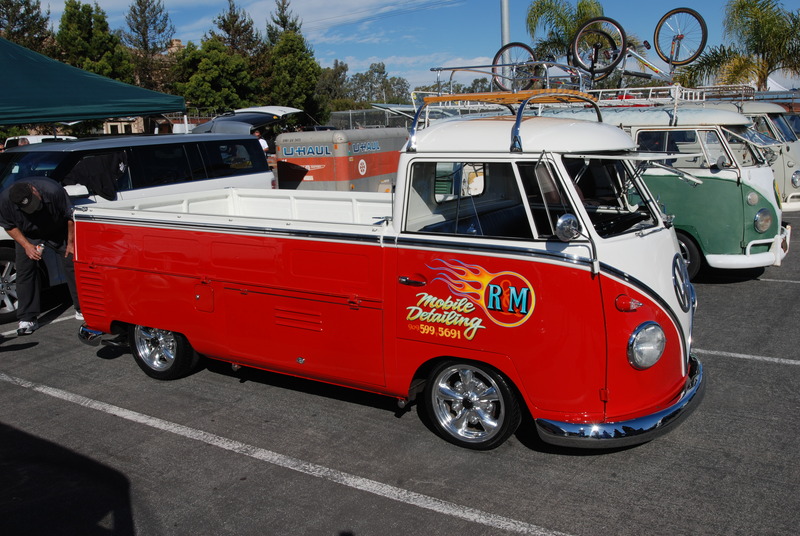 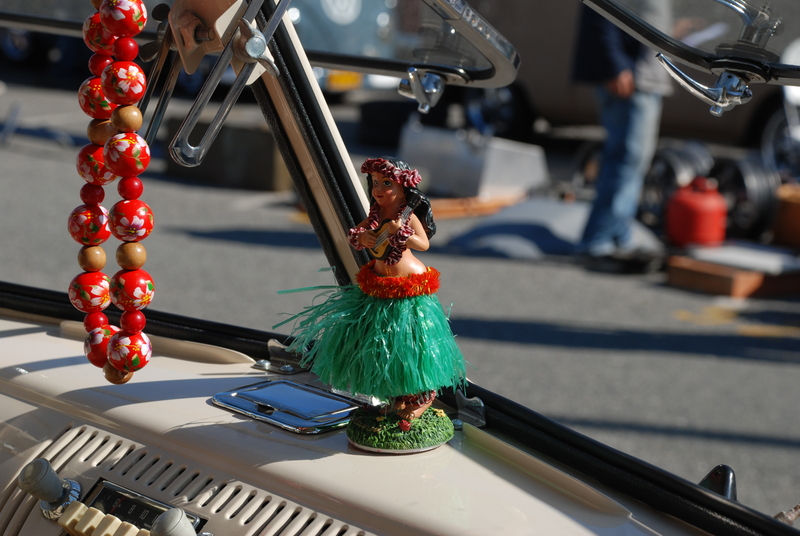 Both events cater to the volkswagen community, while the O.C.T.O club is dedicated to the celebration of the early 1949-1967 transporters. 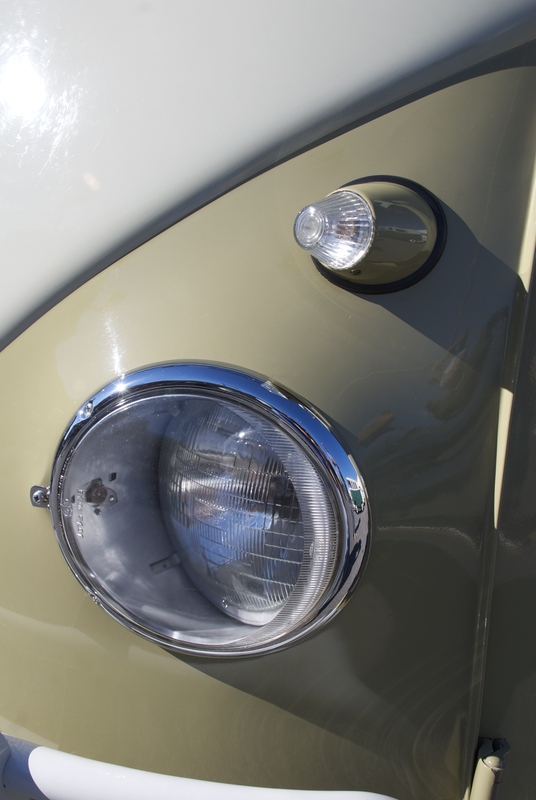 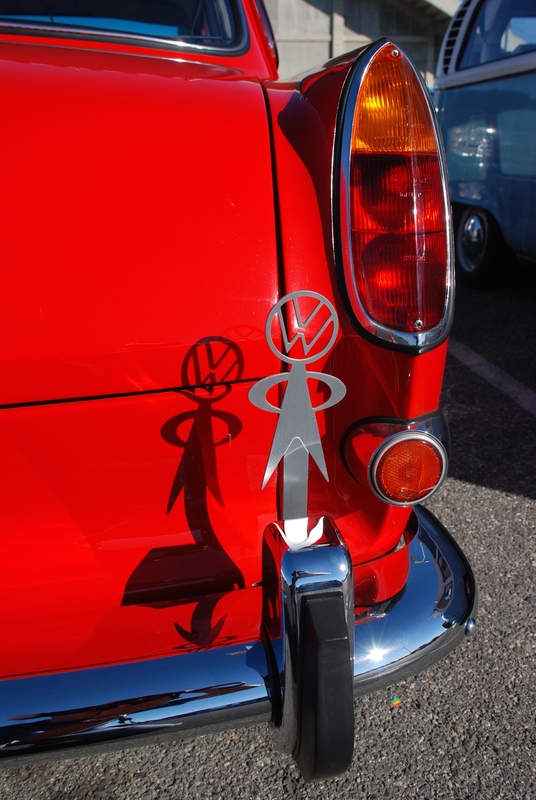 Armed with my camera and allot of questions, I attended my first event, the Bug-In / Treffen 2 back in 2009. 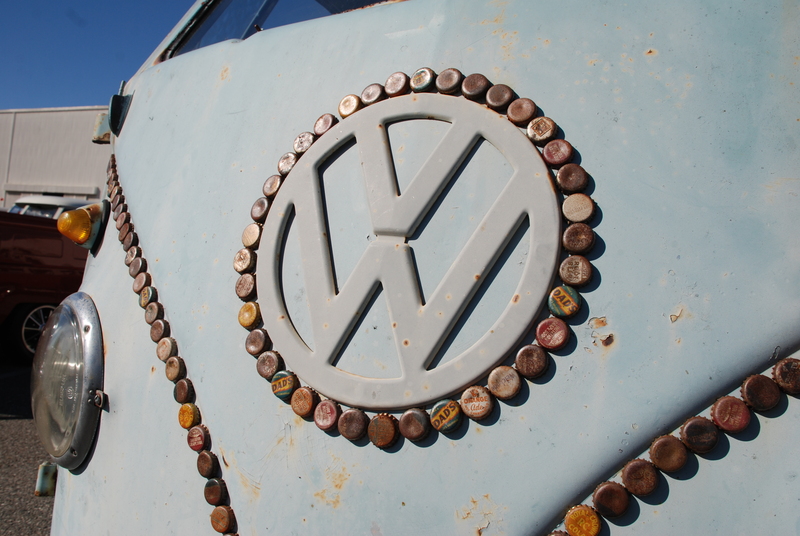 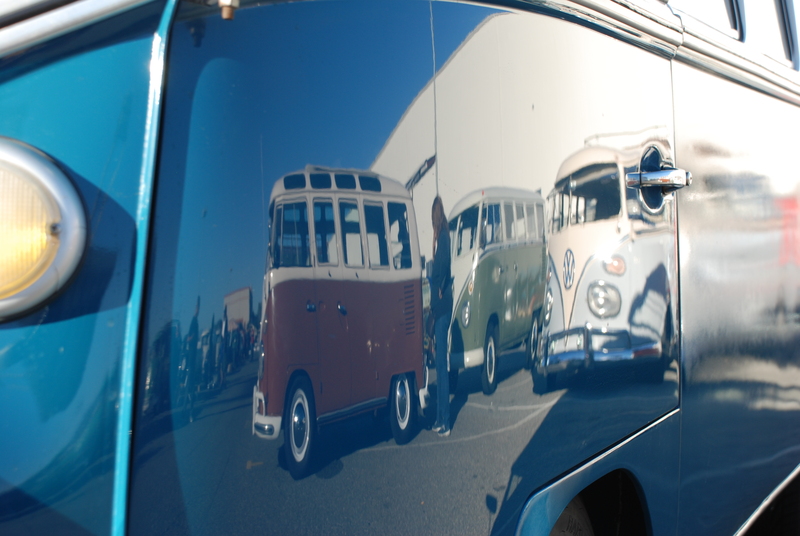 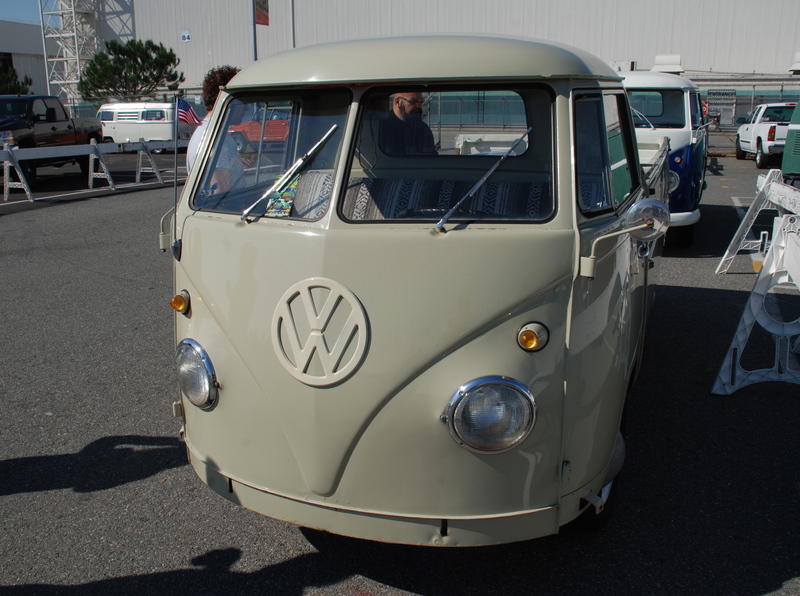 There was an amazing cross section of volkswagens to see, and the number of buses present was mind blowing. 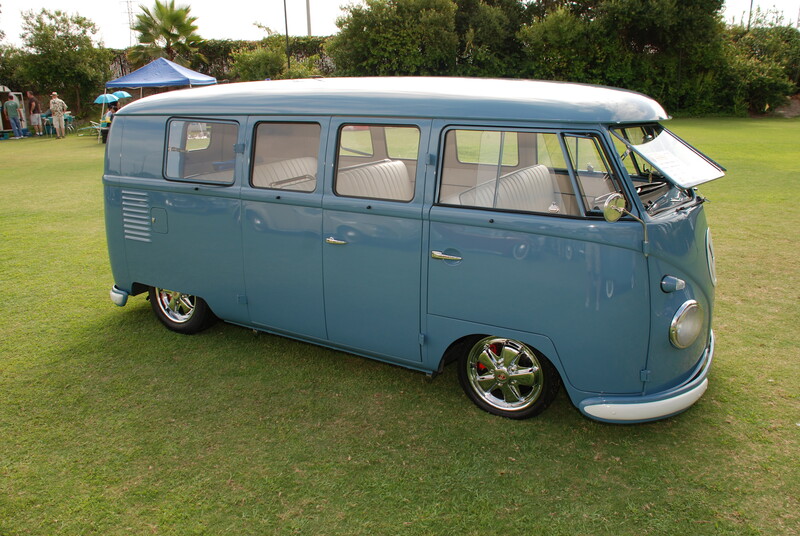 I quickly located several early examples staged on the lawn (both 1957 Kombi’s), but it was the Dove Blue example that really caught my eye. 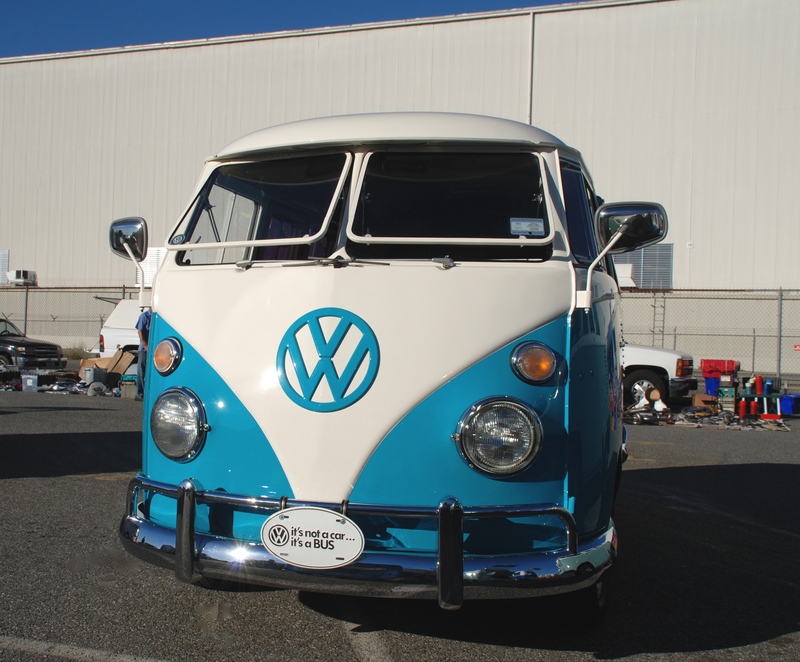 After circling the bus several times and taking a couple photos, I struck up a conversation with the owners ( a husband and wife) and began asking them about their bus. 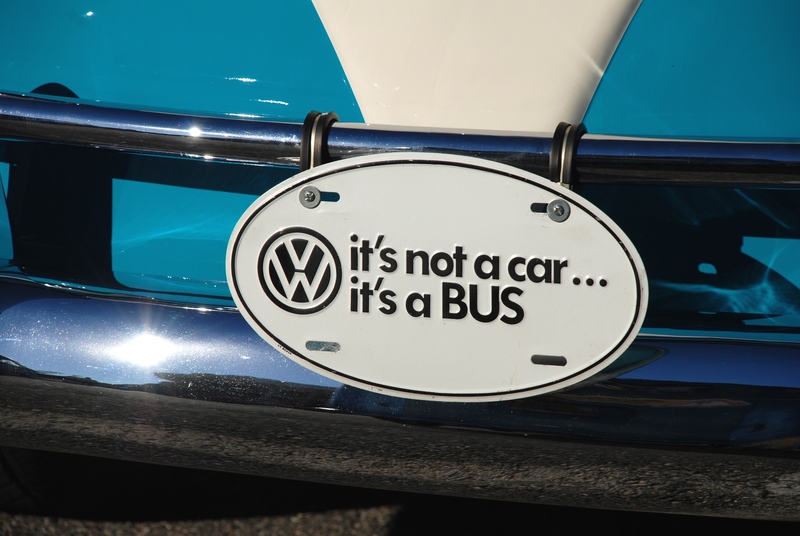 I soon learned that the bus had previously been owned by a Ferrari mechanic, and was one of several from his collection. 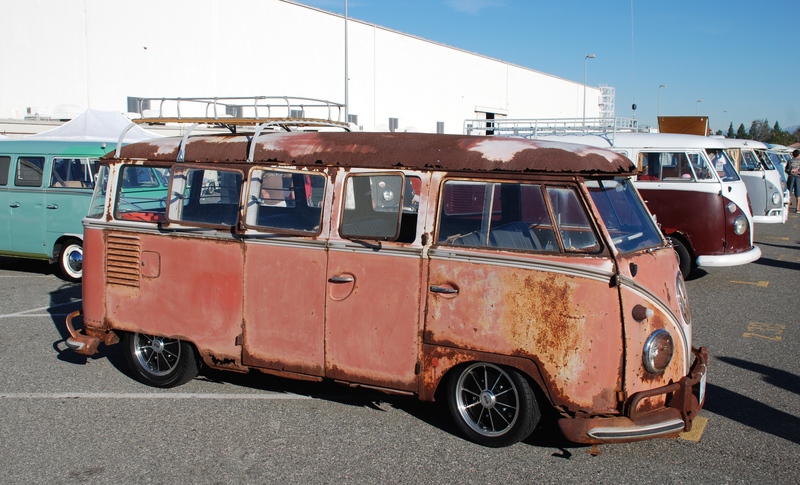 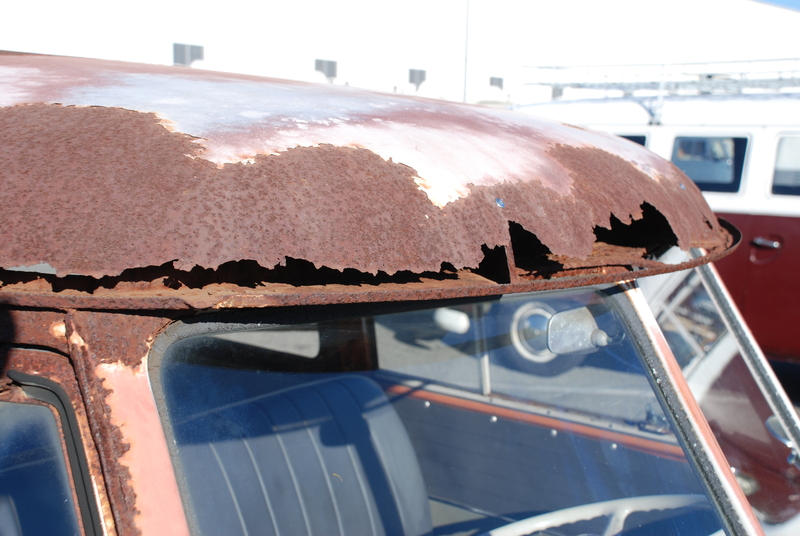 I was then told that fortunately the bus had been very straight and rust free from the beginning, so that during the new owners restoration efforts, there was a minimum of body work required to get it into its present state (which was amazing). 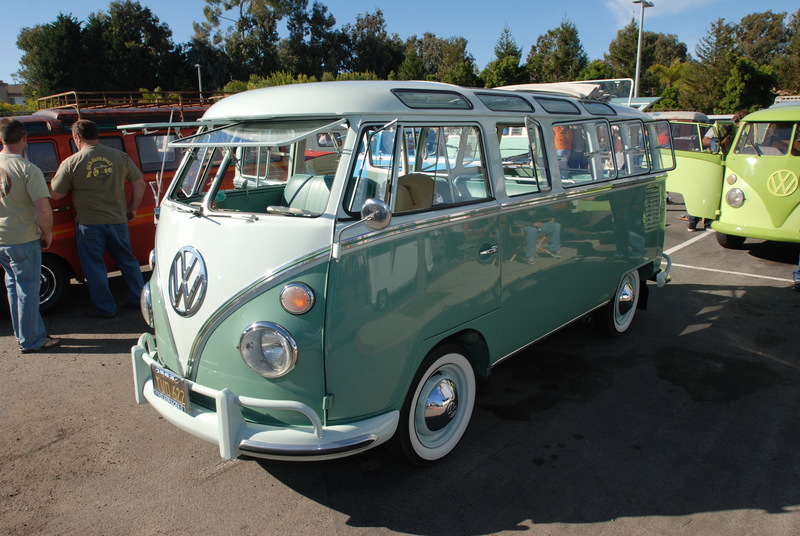 The interior was complete, and had come with all of its original parts. 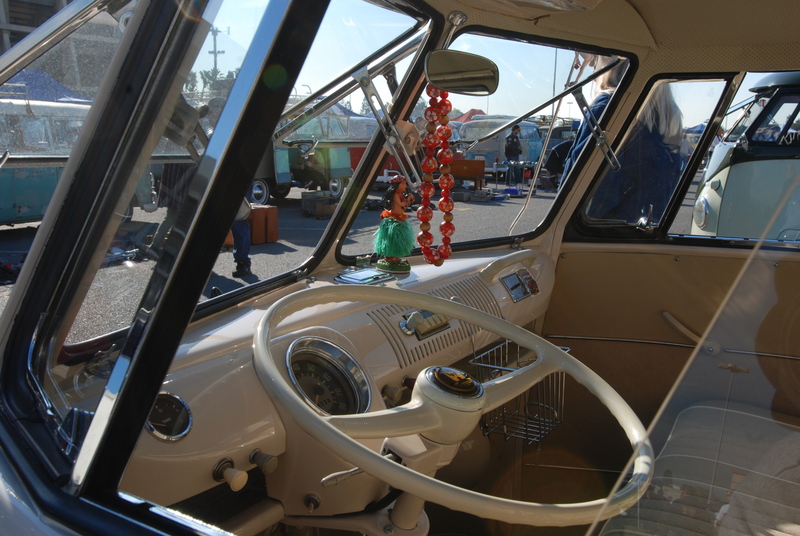 I learned that the hardest decision the owners had to make regarding the interior was to select what color leather to use for redoing the interior, and then choose a contrasting color for the piping. 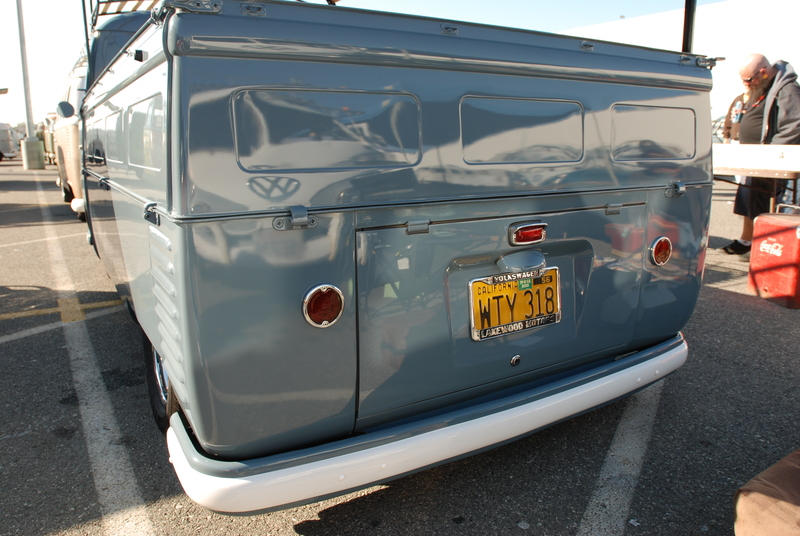 They also went ahead and refinished the seat frames and all of the hardware to bring the interior back to like-new. 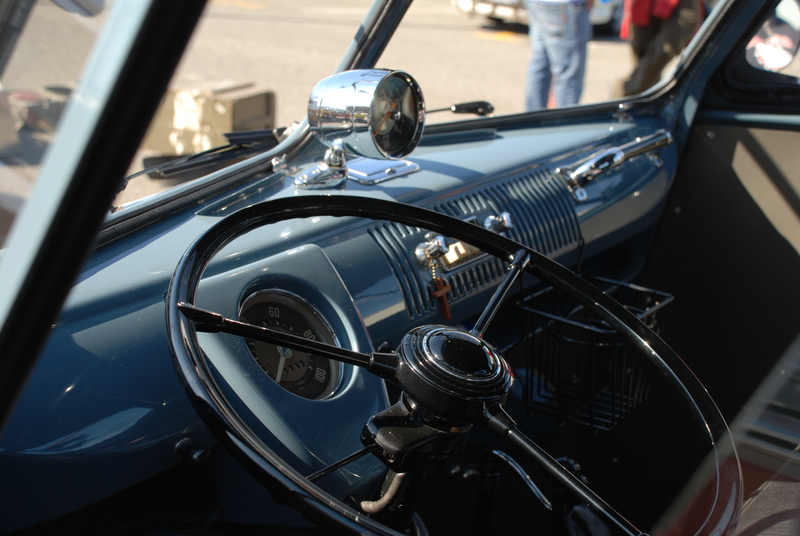 All of their efforts paid off, as the interior was stunning and the perfect compliment to a beautiful exterior. 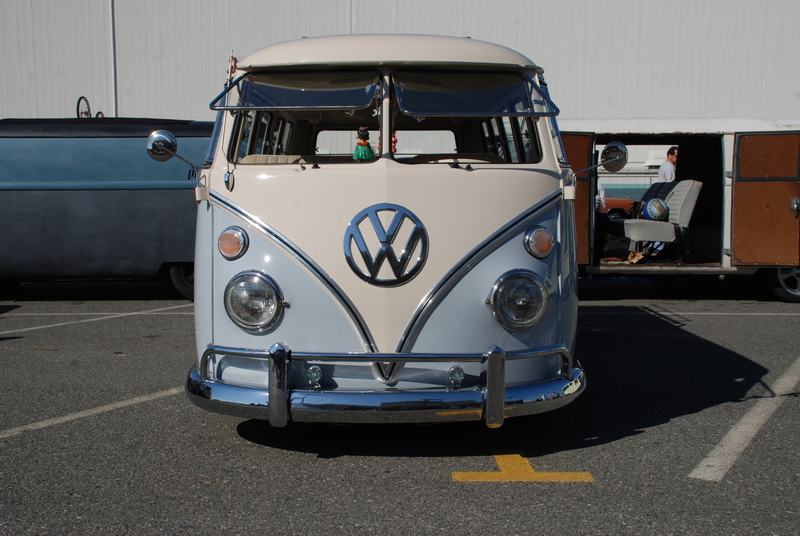 Underneath , the suspension had been rebuilt and the entire bus had been lowered. 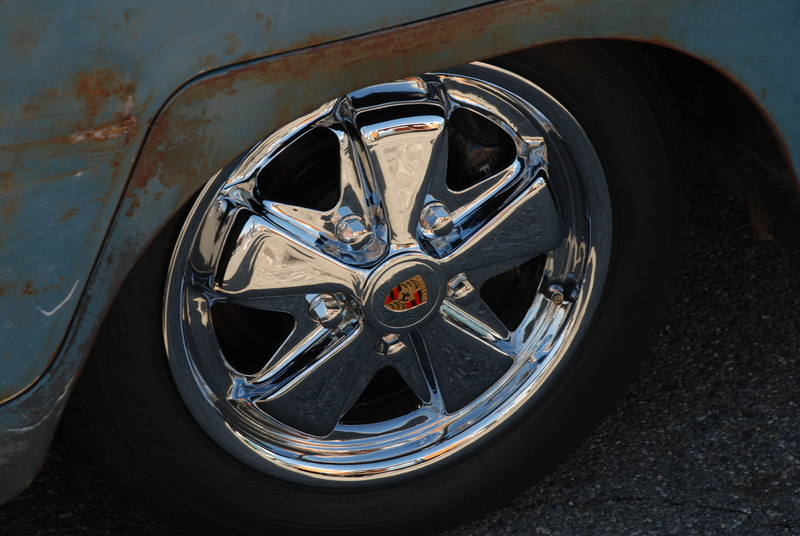 For brakes, a set of red Porsche 944 calipers were selected for all four corners. 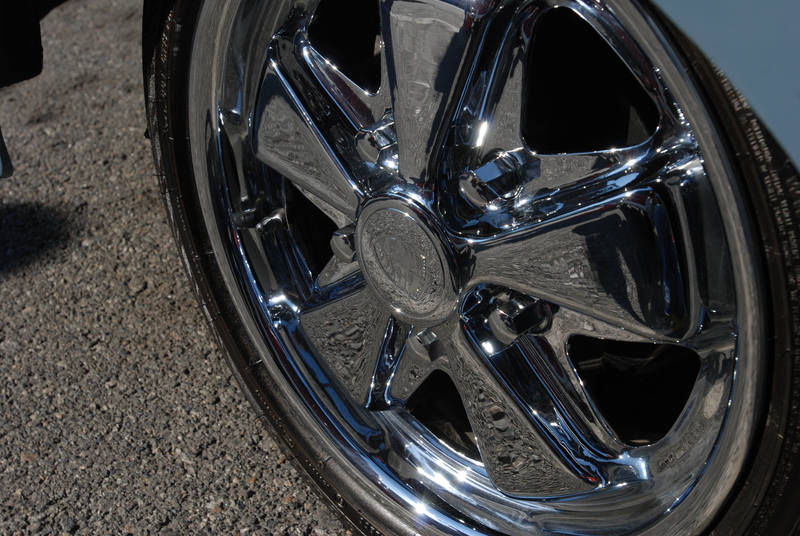 These sat behind four chromed, Porsche 5 spoke fuch alloy wheels. 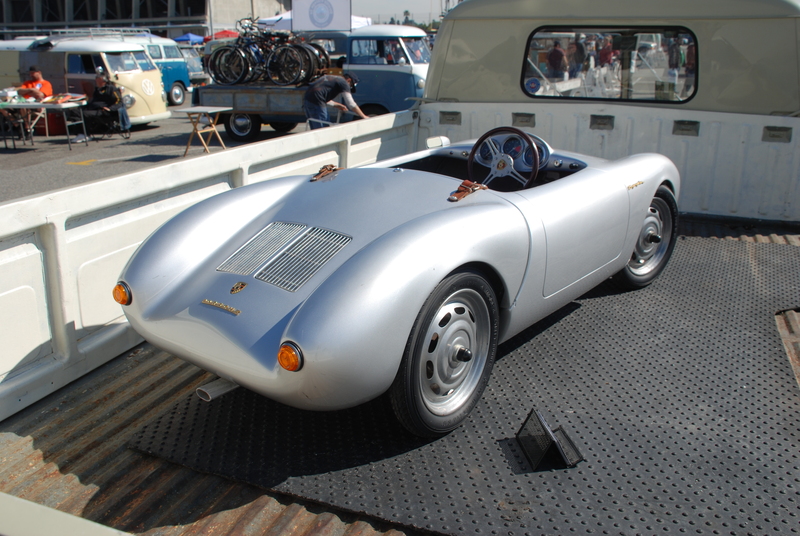 Up front, a set of the increasingly rare and even harder to find, original Porsche 4 1/2″ X15″ fuch 5 spoke alloy wheels were sourced. 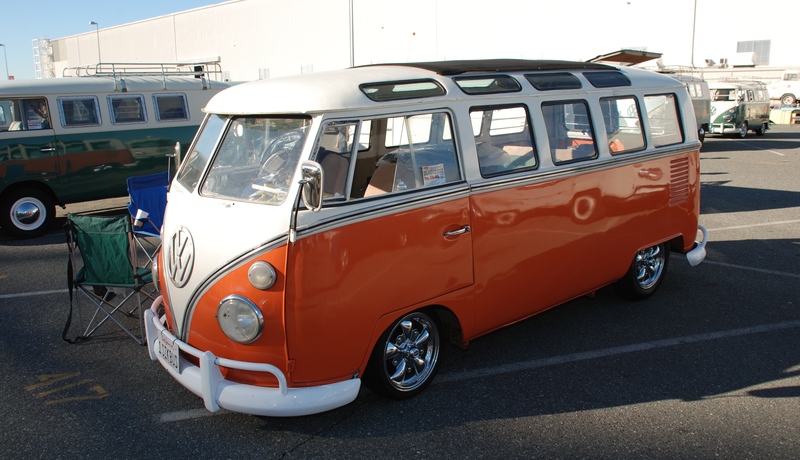 Out back, the bus rode on a set of factory 6″X15″ fuch 5 spoke alloys. 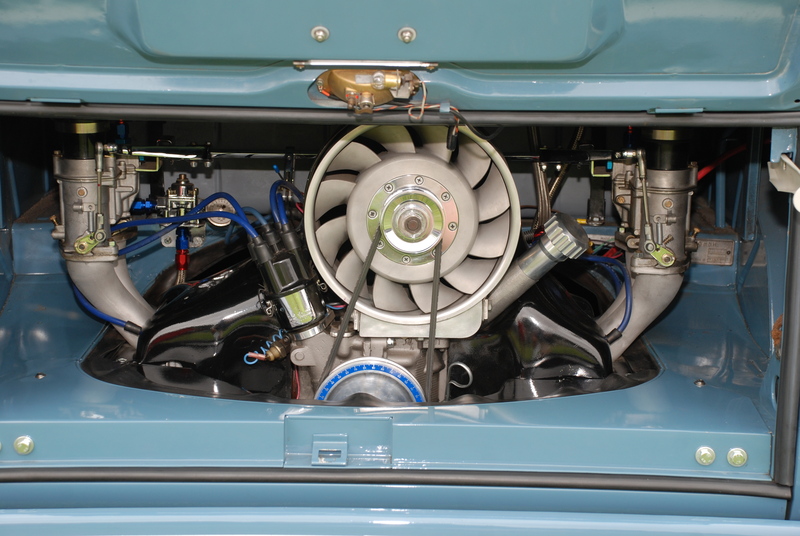 But the hidden jewel was revealed when the owner opened up the engine lid. 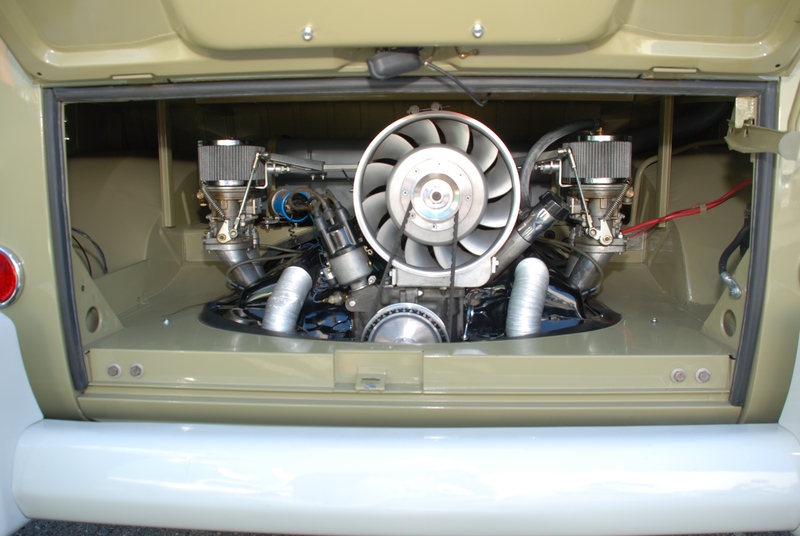 Inside sat a highly modified, beautifully detailed, Porsche fan shrouded street motor producing as the owner described “gobs of horsepower and torque”, enough to transform the bus into what he called their “freeway flyer”. 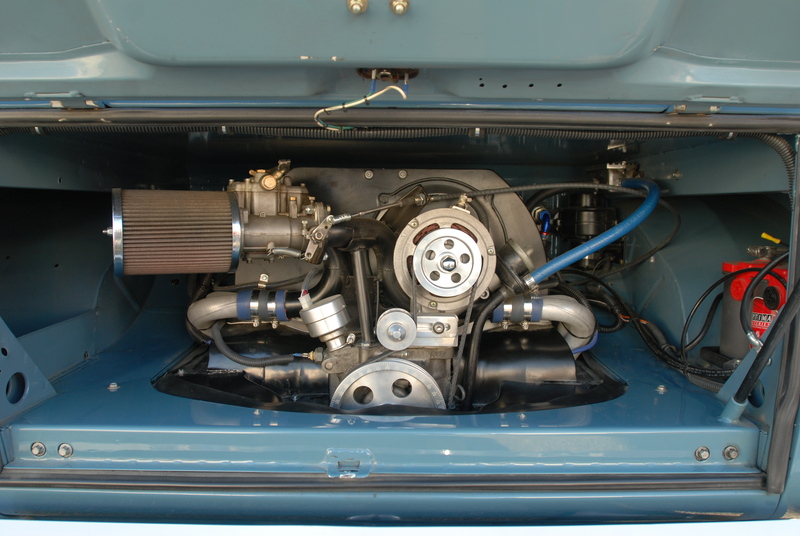 If I recall, their motor was somewhere in the realm of 2300 CC, a far cry from the small displacement motor that originally occupied the same space. 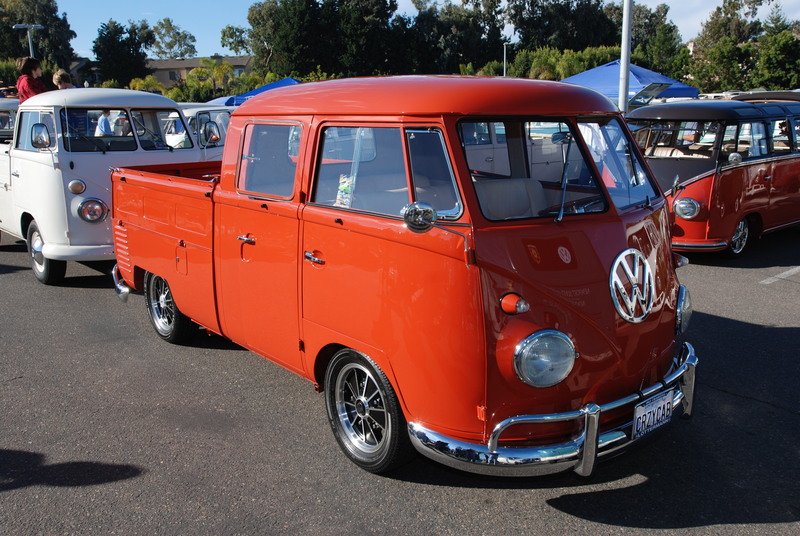 When I left the event later that afternoon, I was impressed by the friendliness and enthusiastic nature of the many owners who had patiently answered my questions and who had freely shared the back stories regarding their vehicles. 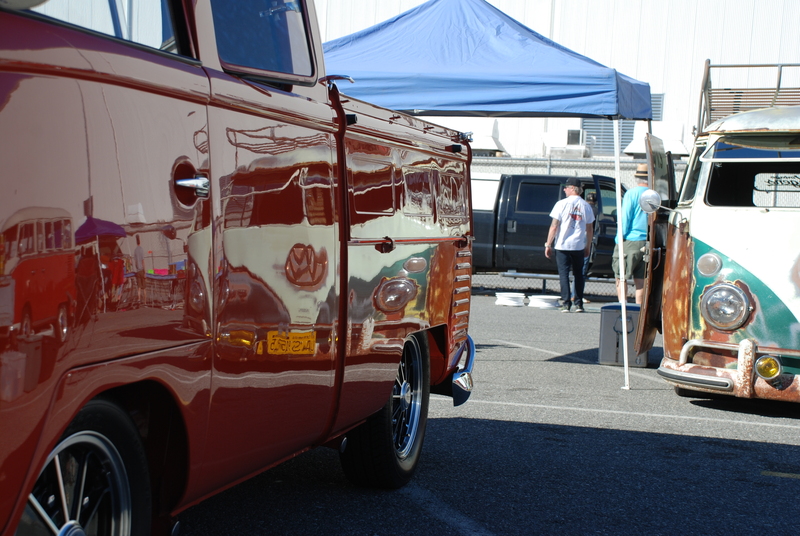 More recently, in February of this year, I attended the O.C.T.O. 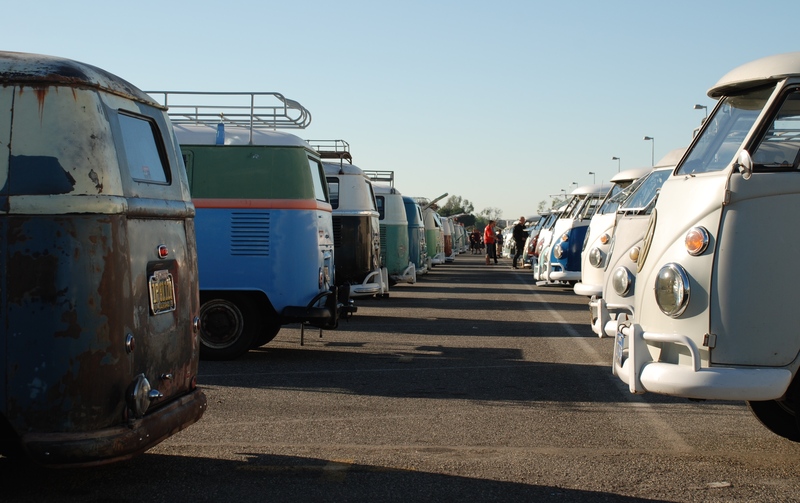 Winterfest event, which was a singular celebration of type 2 transporters. 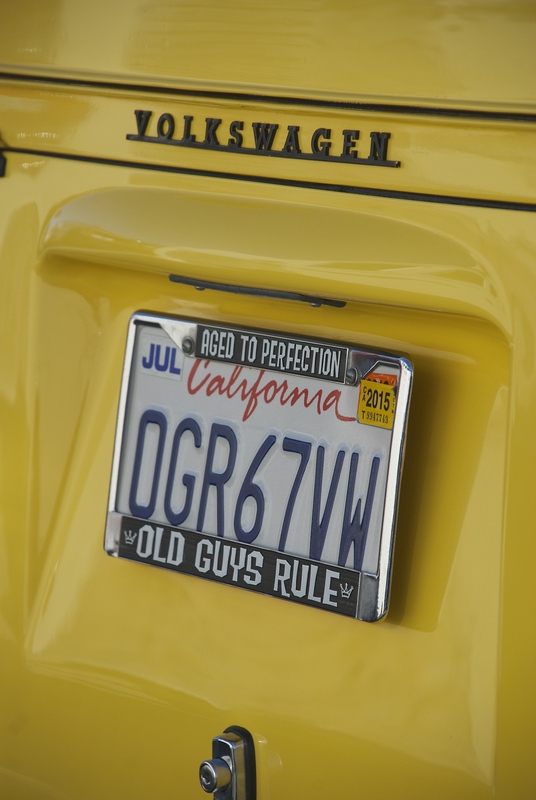 Once again, I encountered an amazing collection of vehicles, and the same friendly environment and willingness on the part of the owners to share their stories and answer my questions. 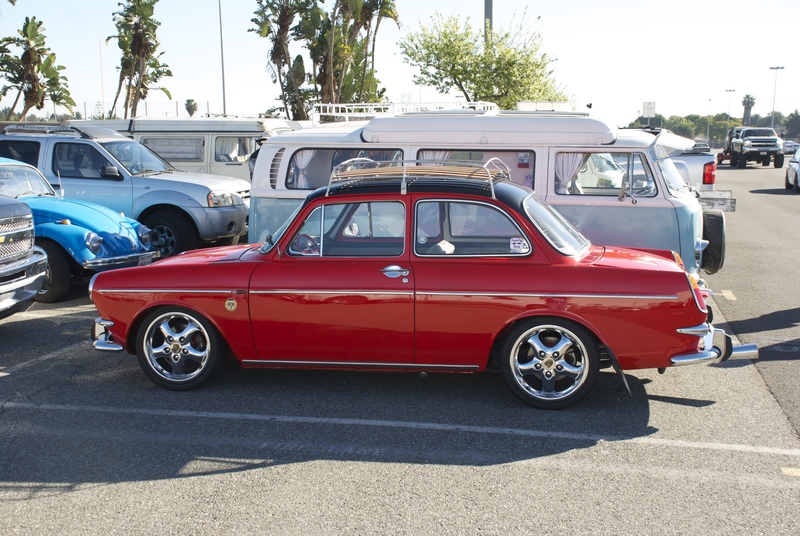 I came away from this event with an even greater appreciation for the VW community, and have some great photographic resources to draw upon for future project inspiration. 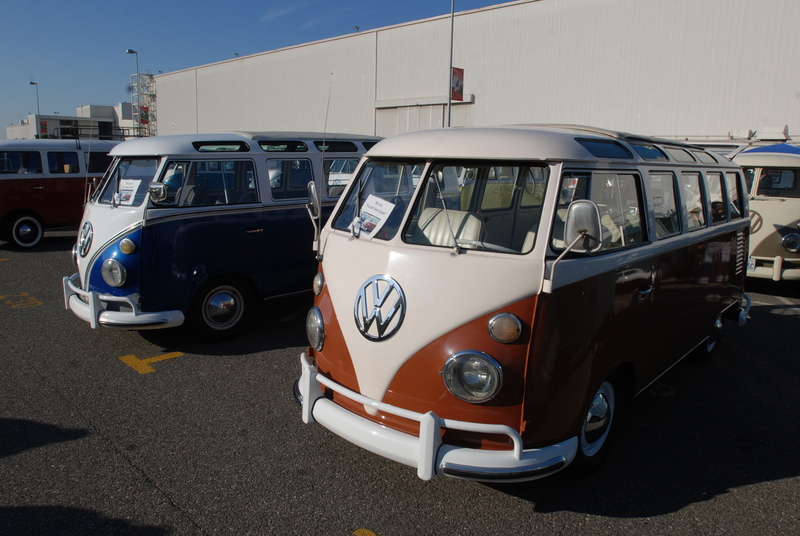 The following photos represent a small sampling of the type 2 transporters that were on display at the Winterfest event back in February.